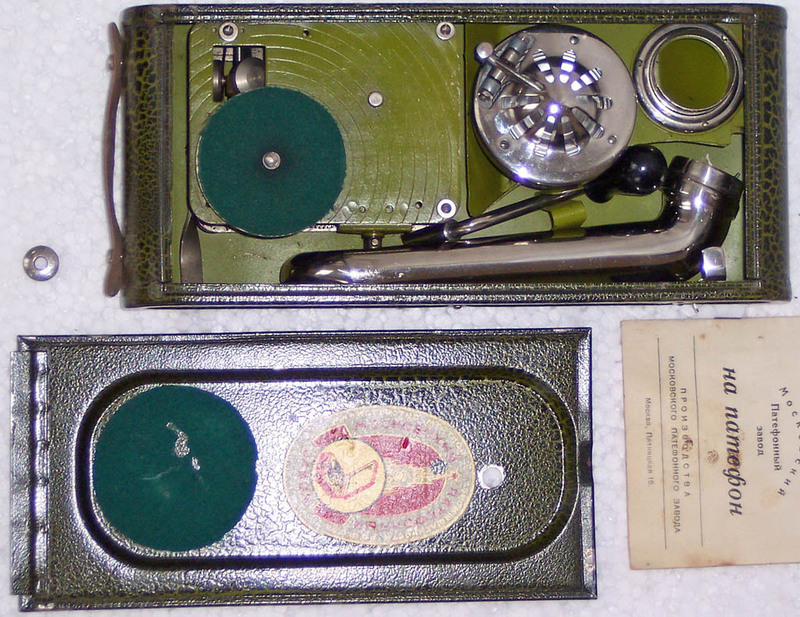 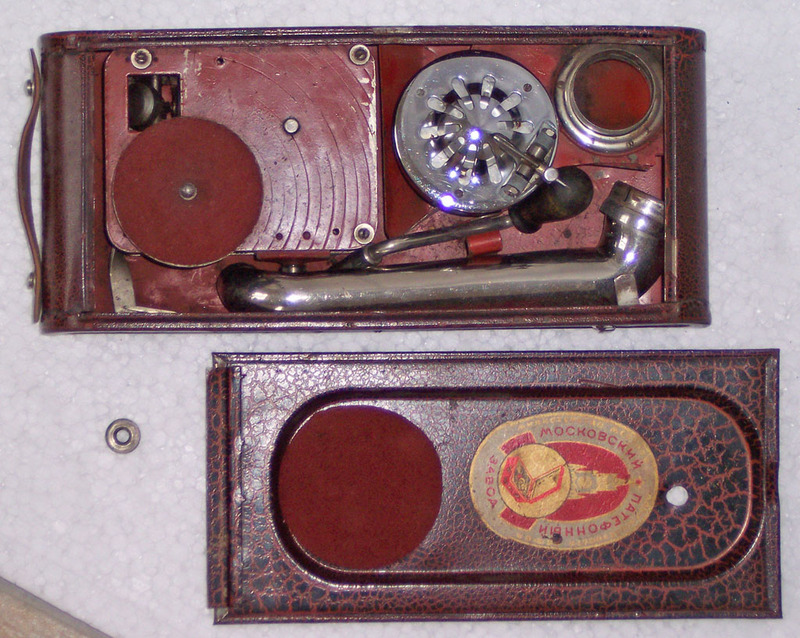 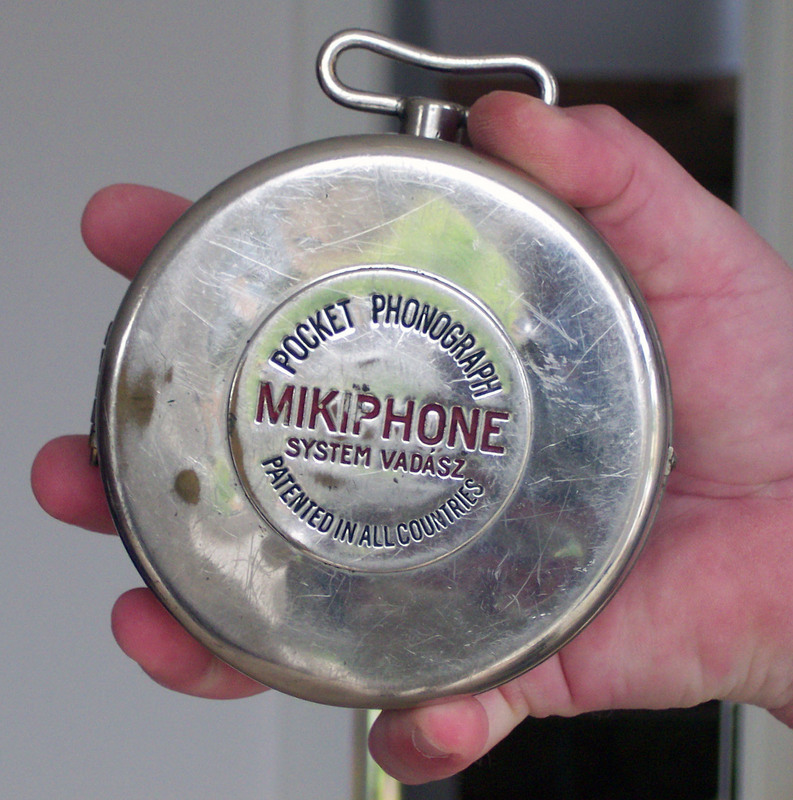 Pocket phonograph Mikiphone, 7 rare and 1 common Russian (sovietic) portable gramophones, gramophone with horn, 92 gramophone disks, thousands of gramophone needles. 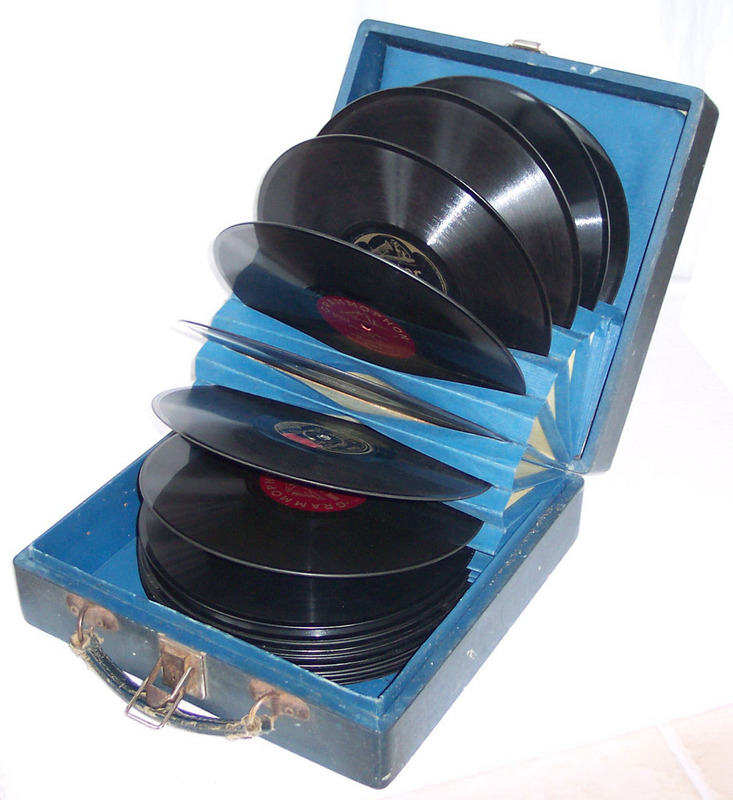 All is original, collected for 7 years. 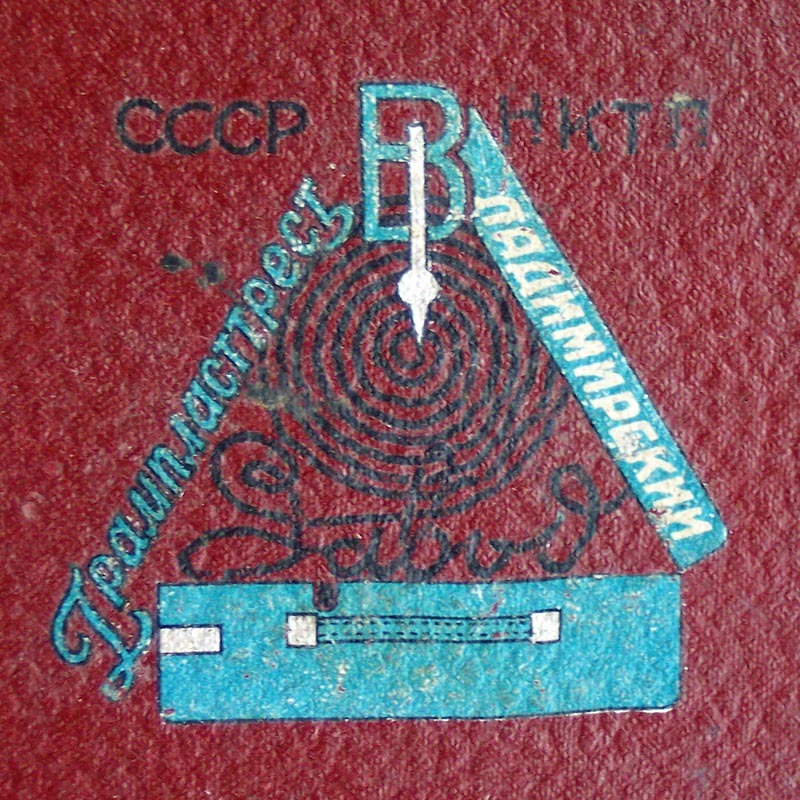 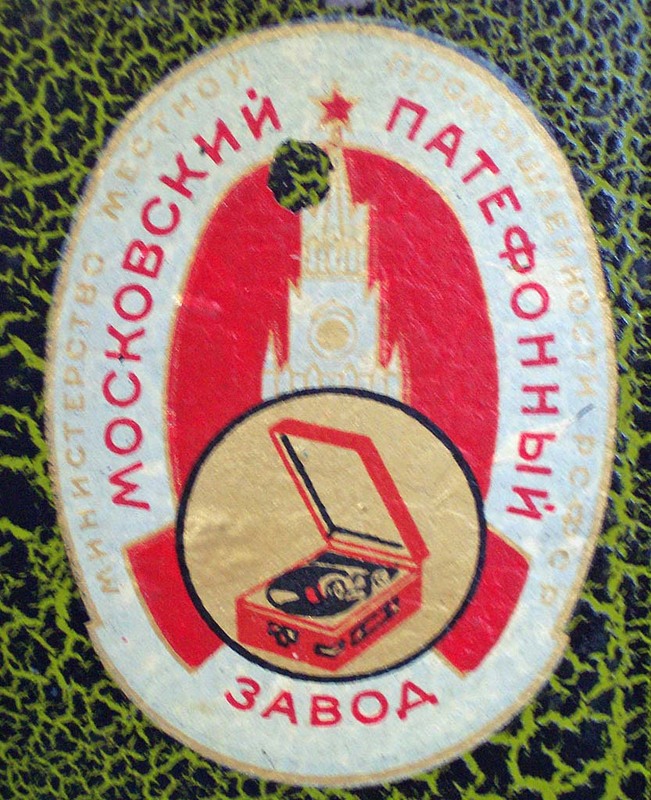 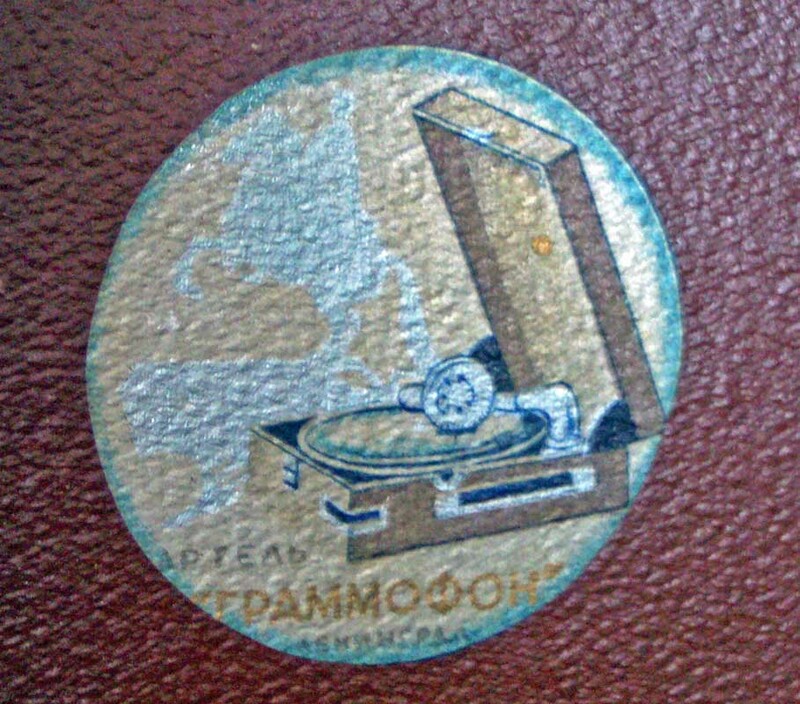 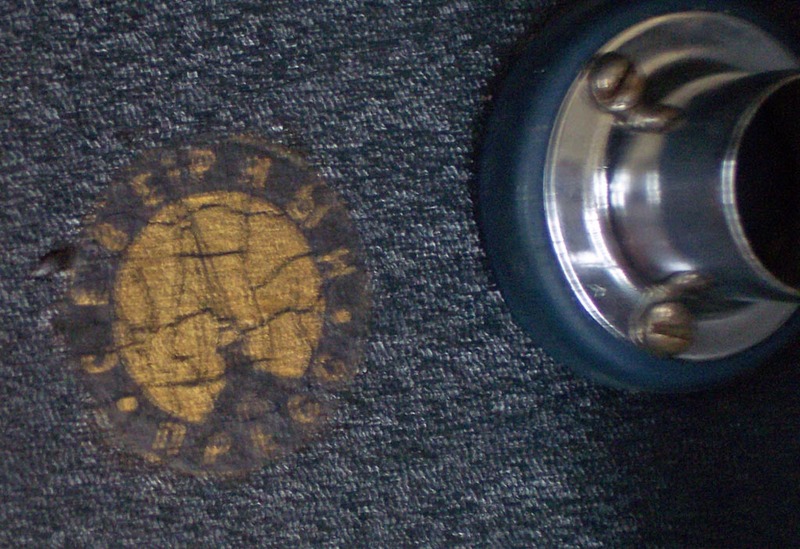 The first gramophone disk in Russia was stamped by french firm Pathé, and disks were distributed in all country by it's agents. 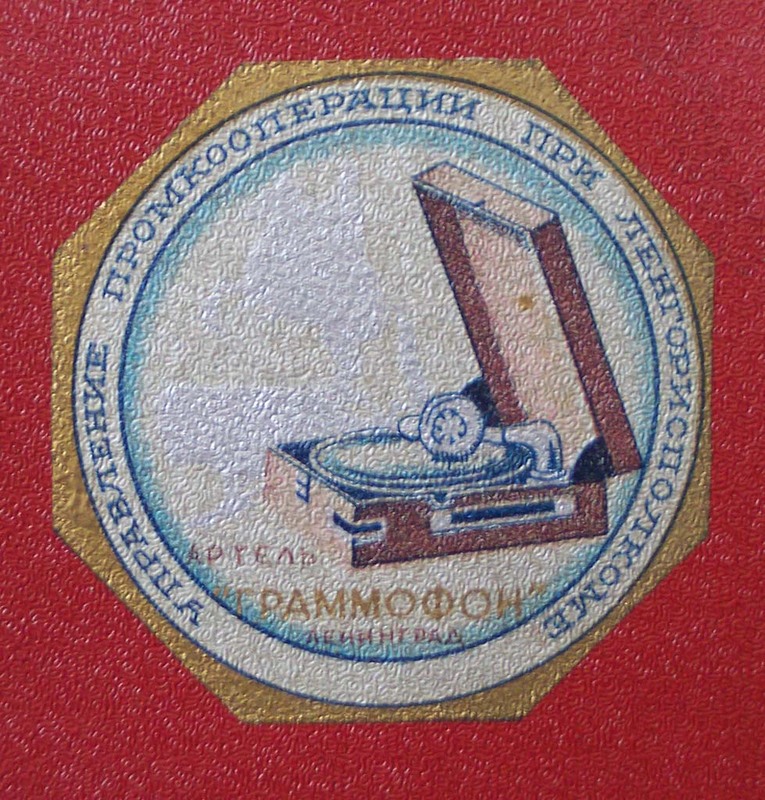 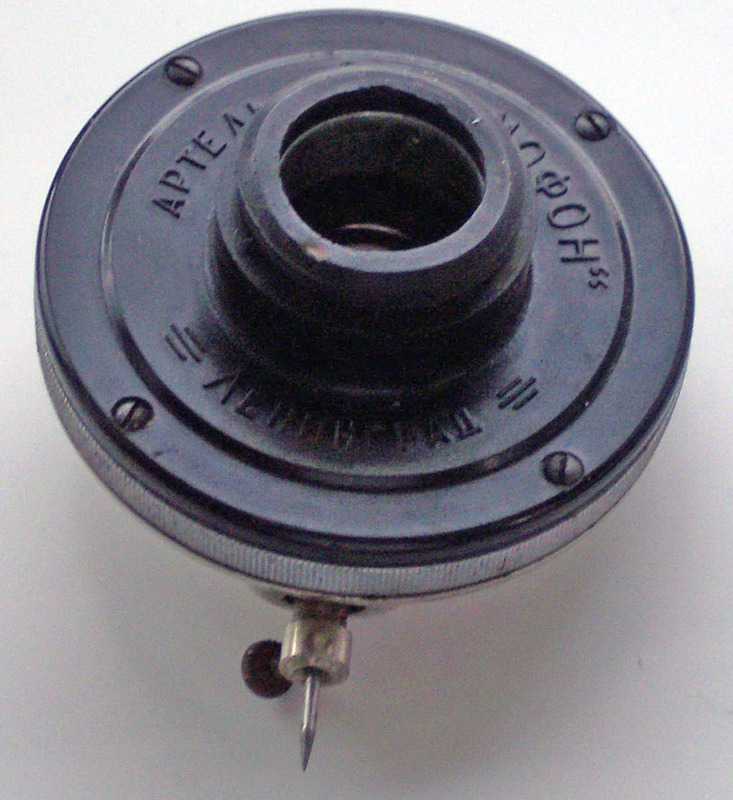 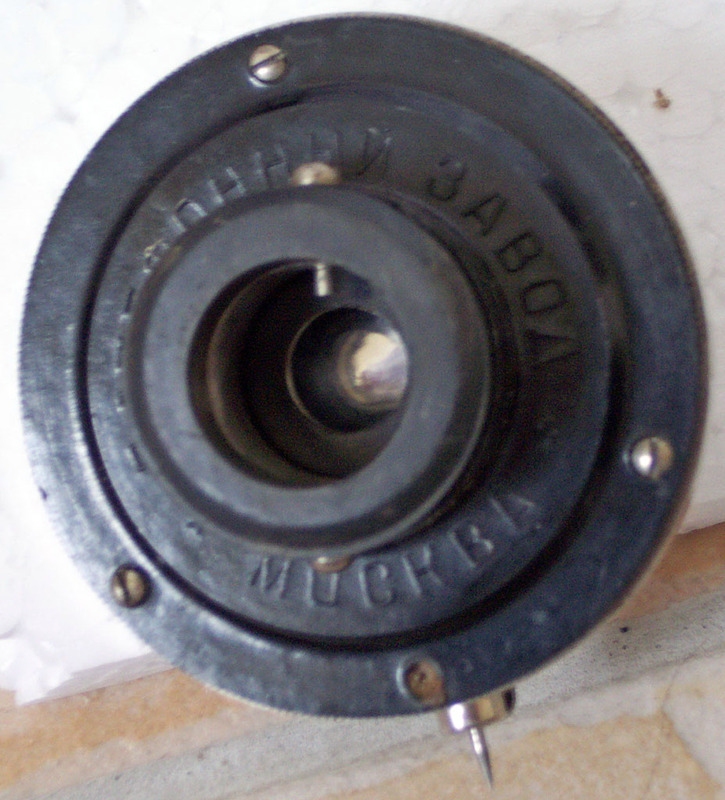 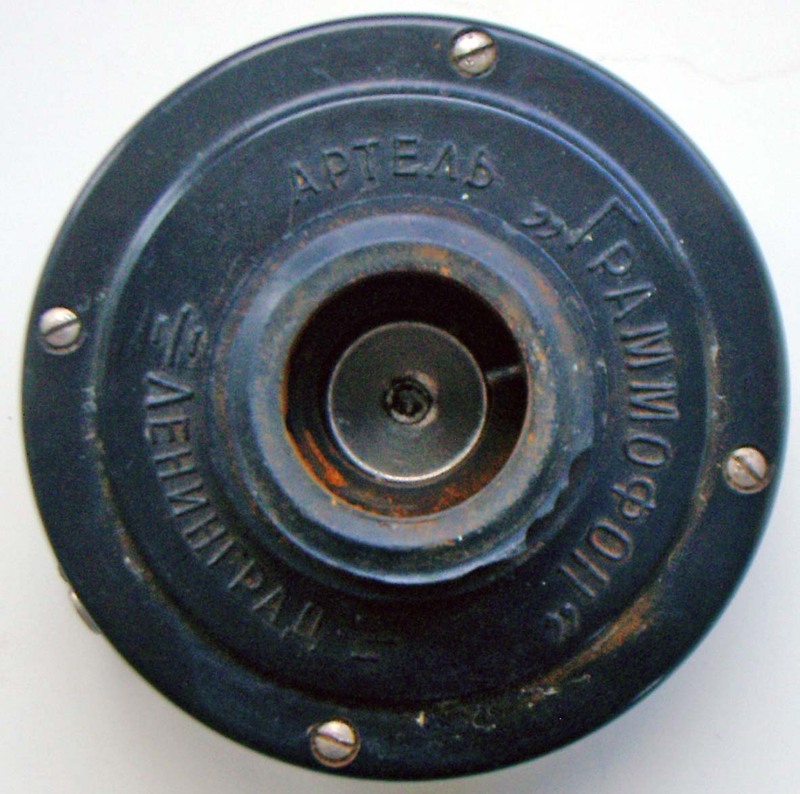 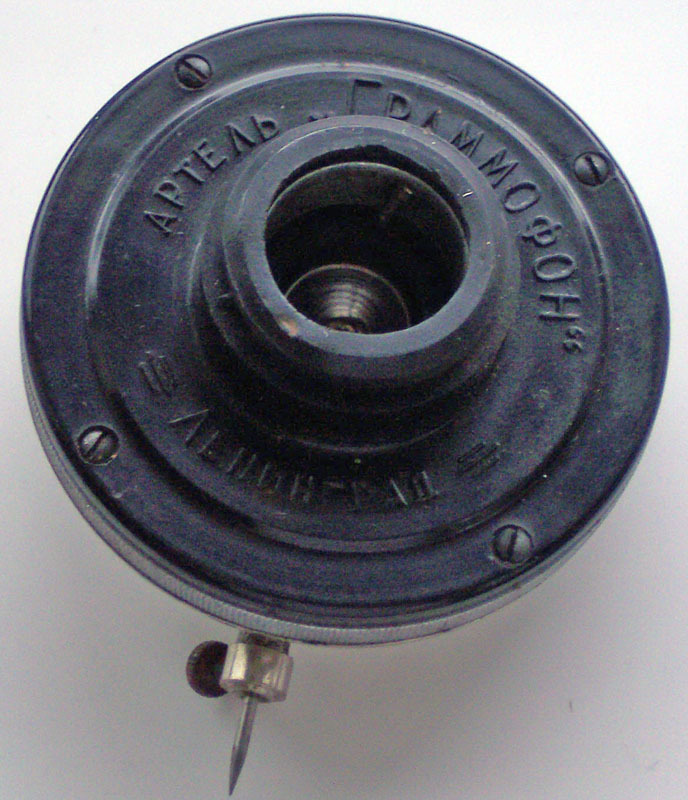 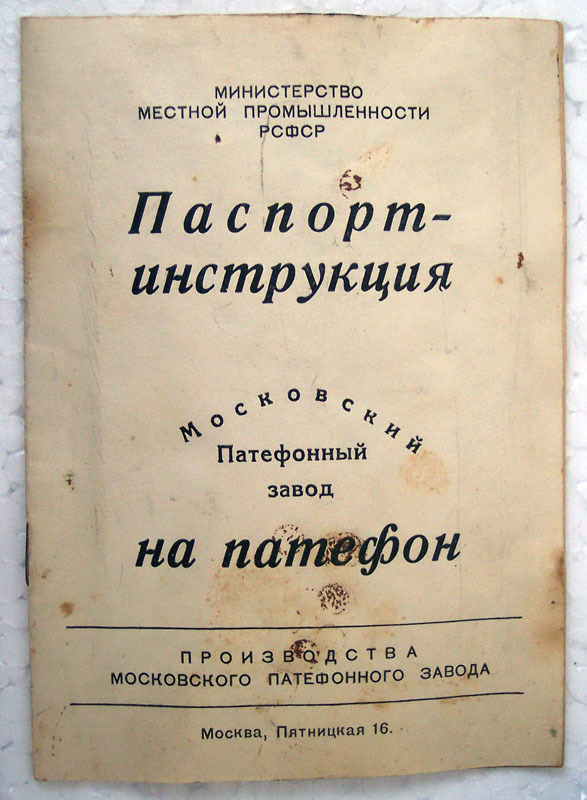 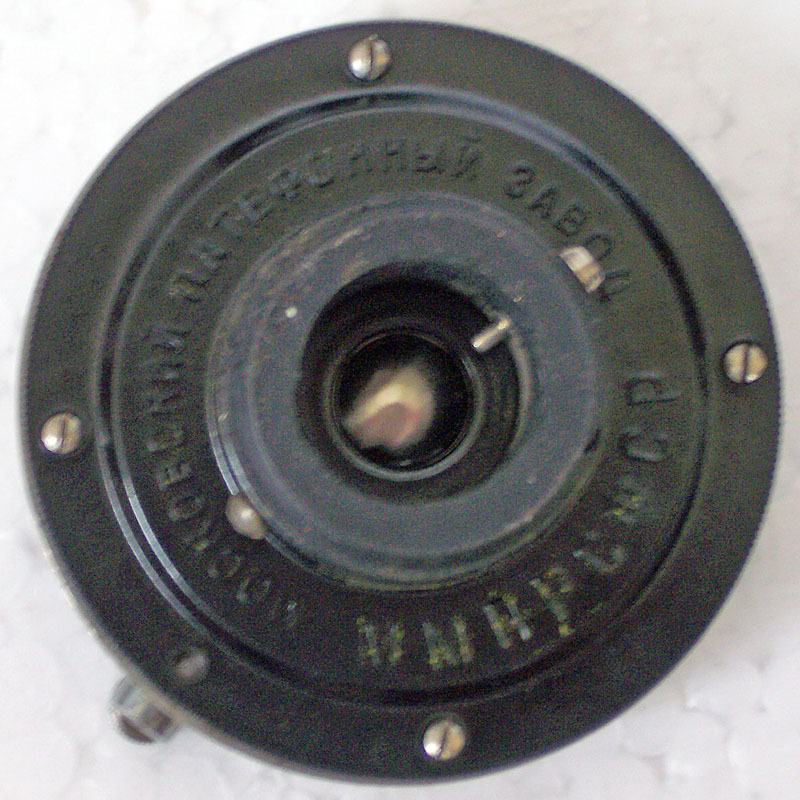 So "gramophone" in Russian is "pathéphone" (патефон). 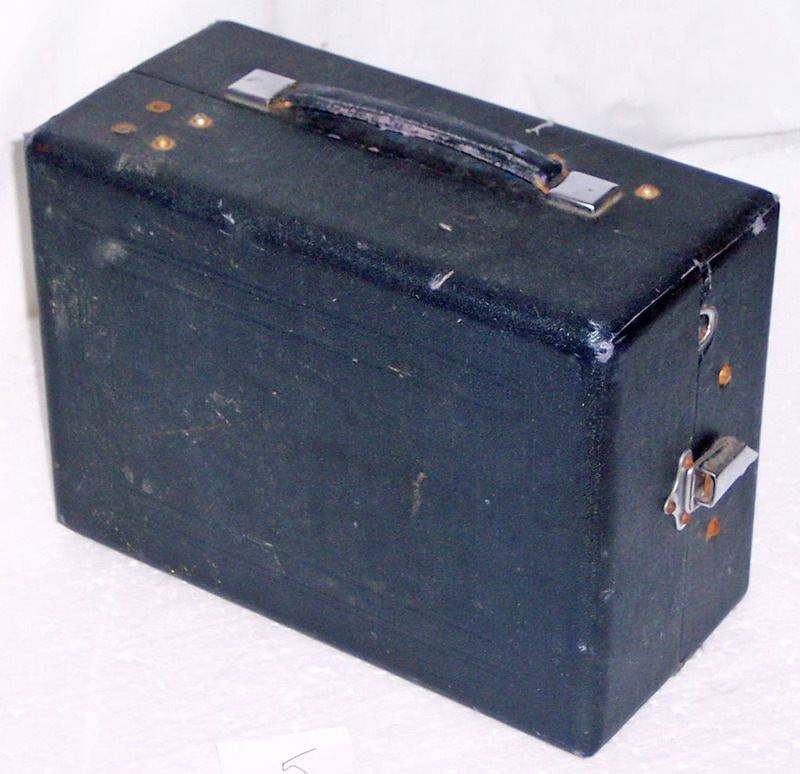 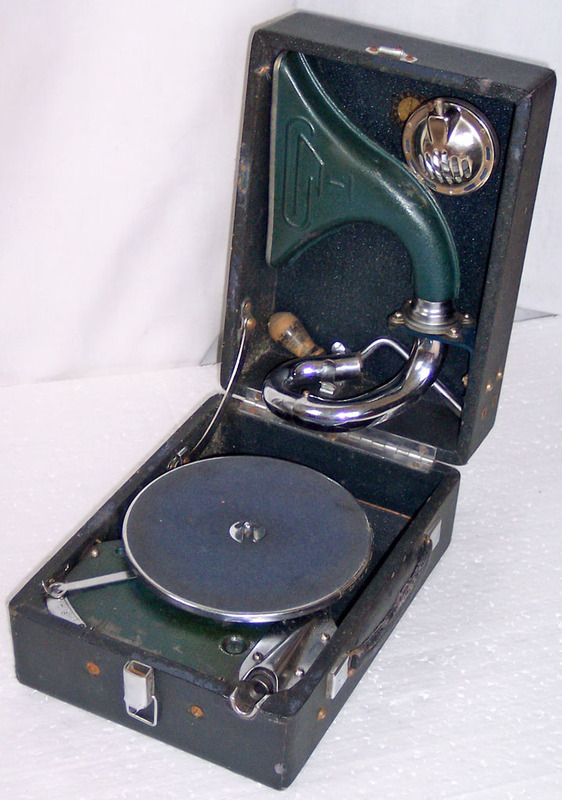 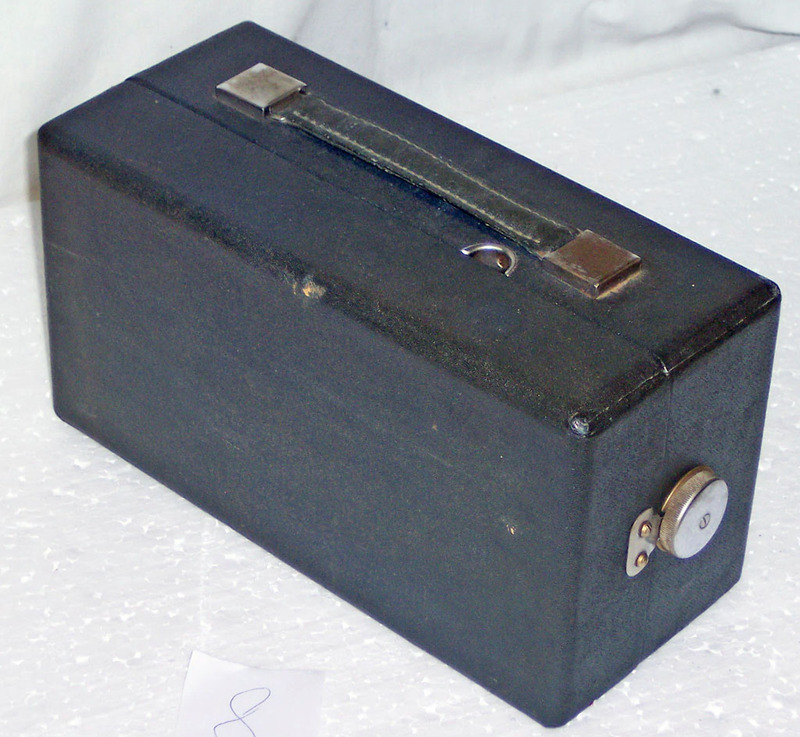 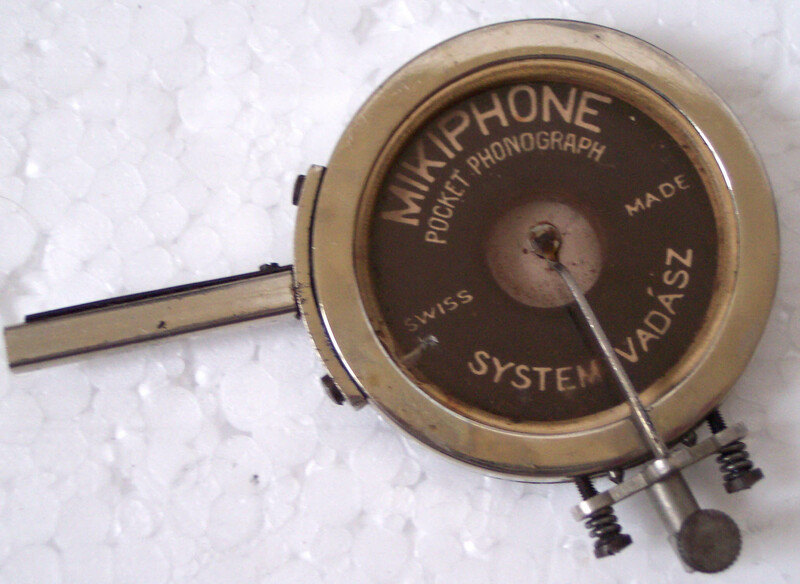 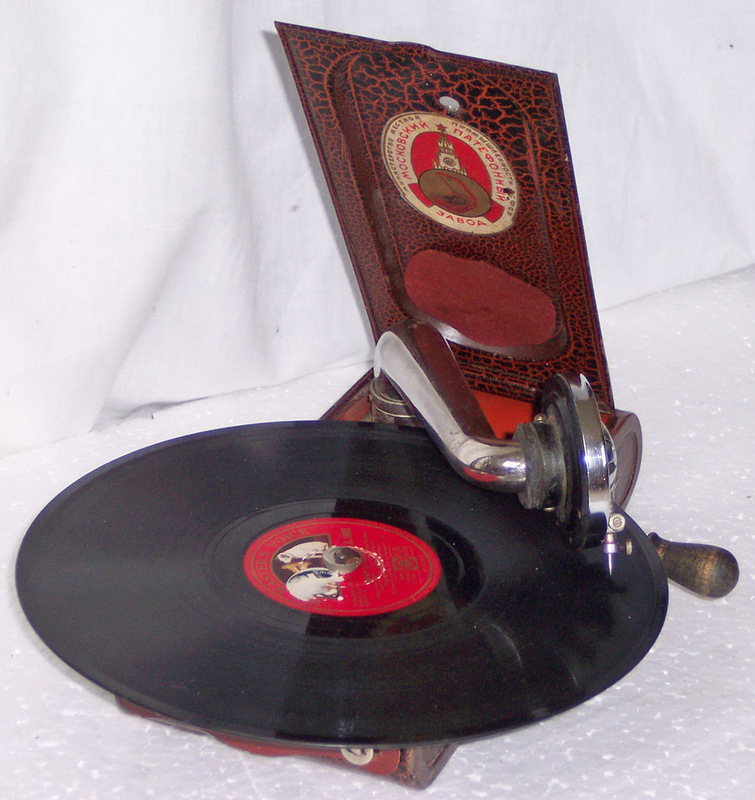 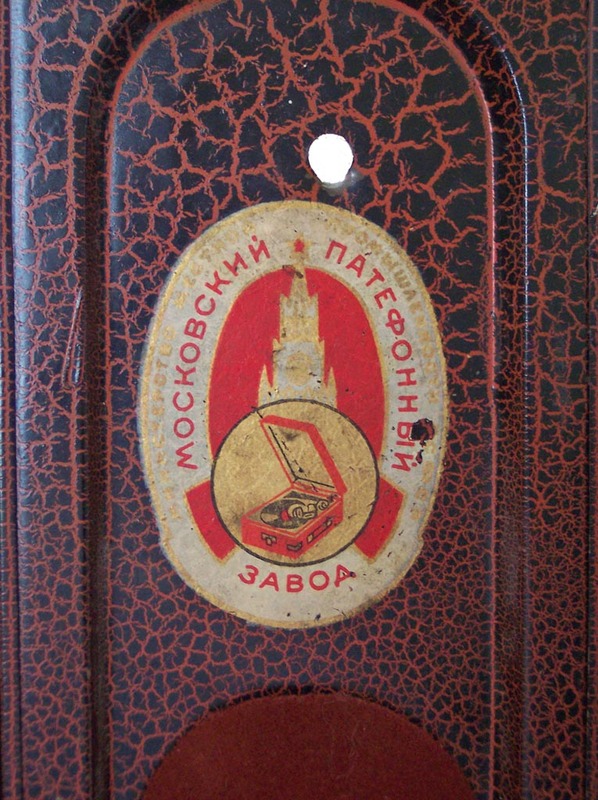 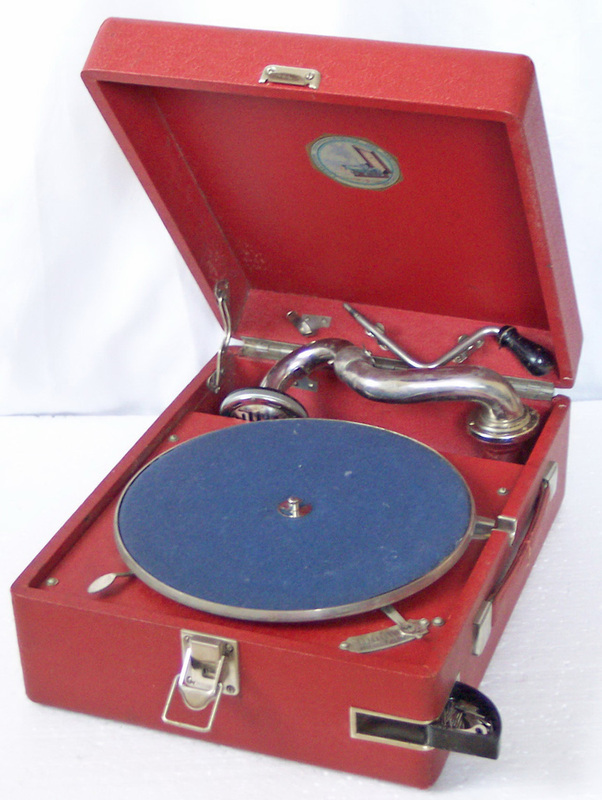 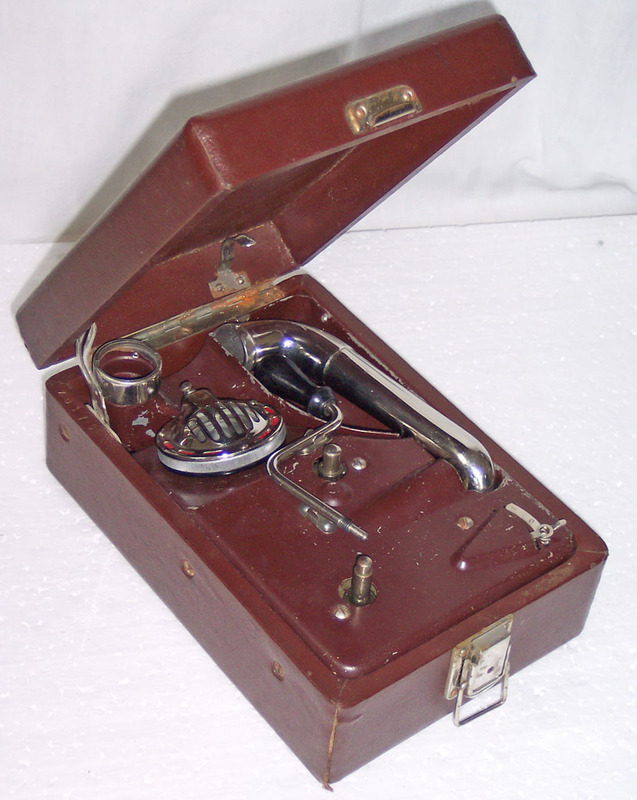 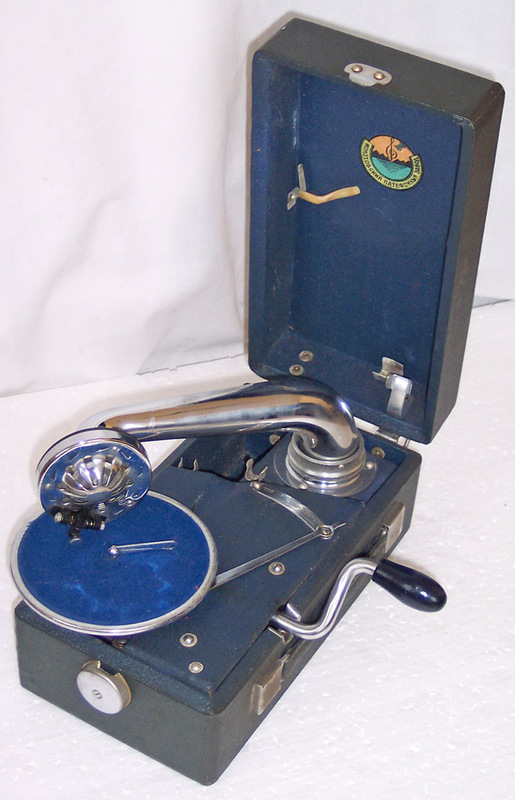 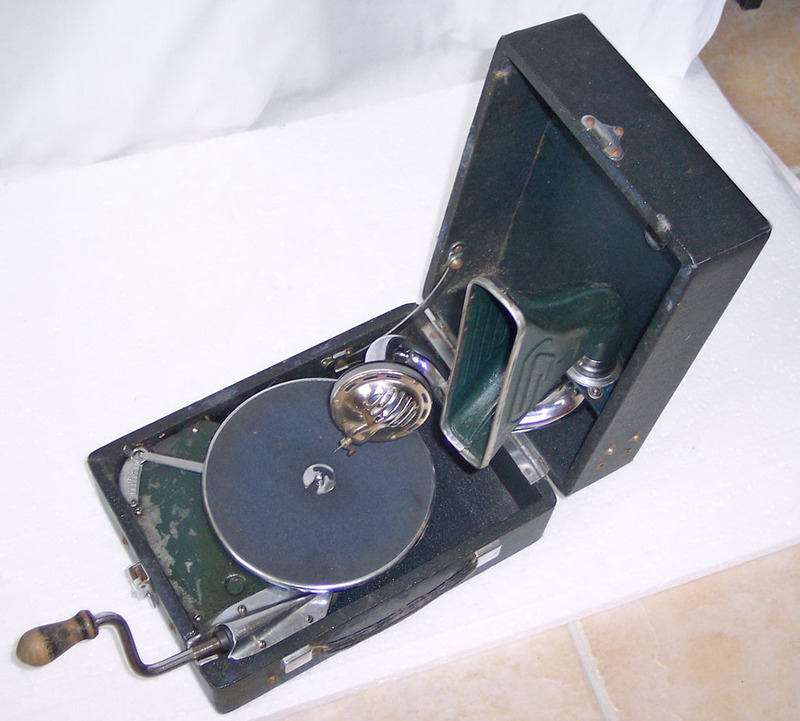 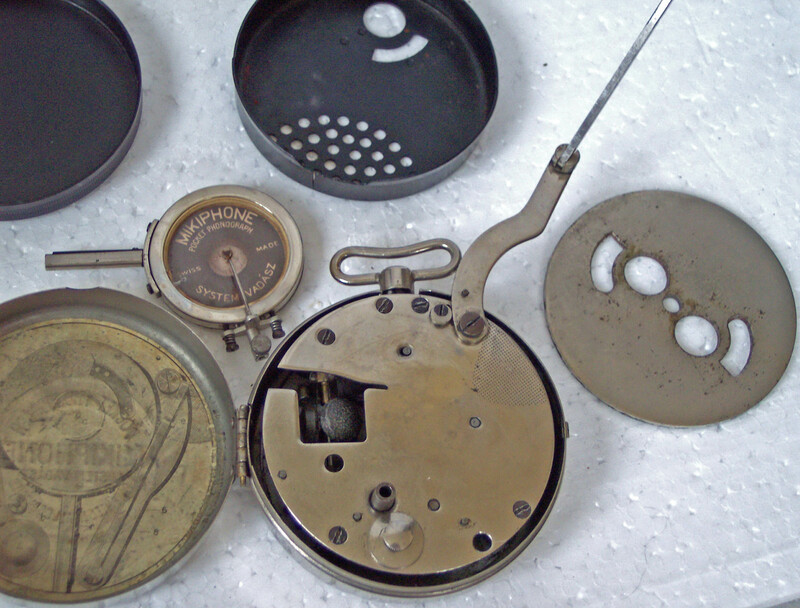 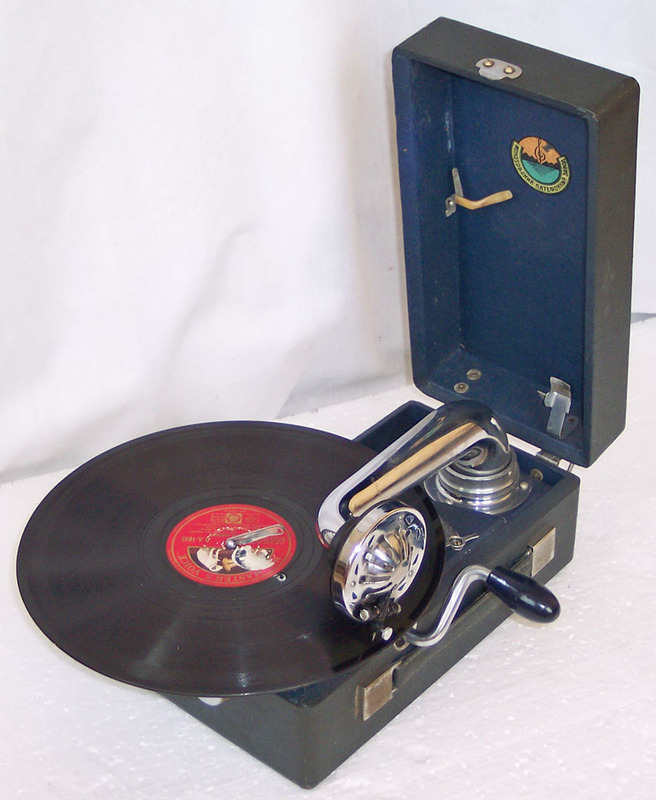 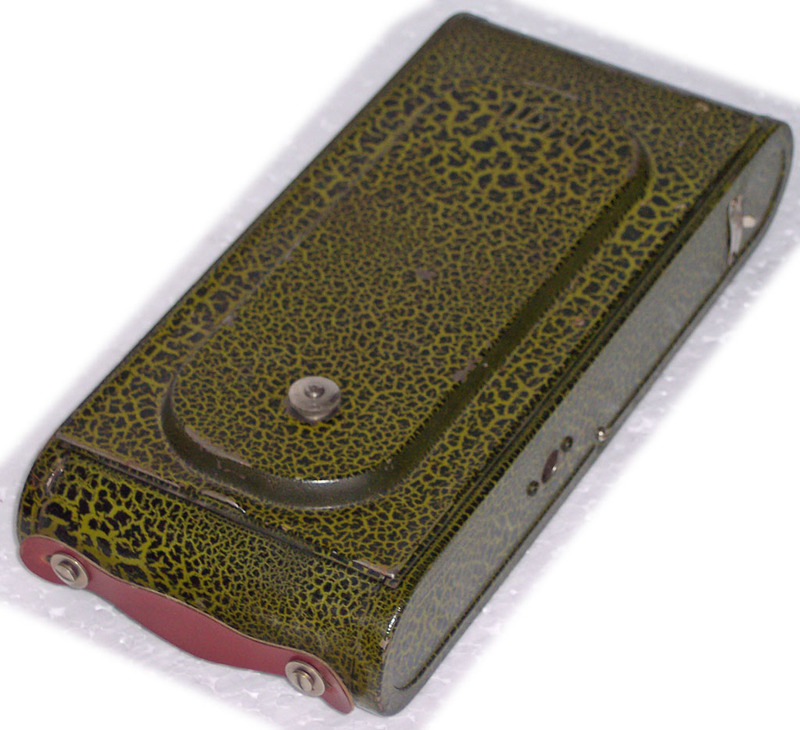 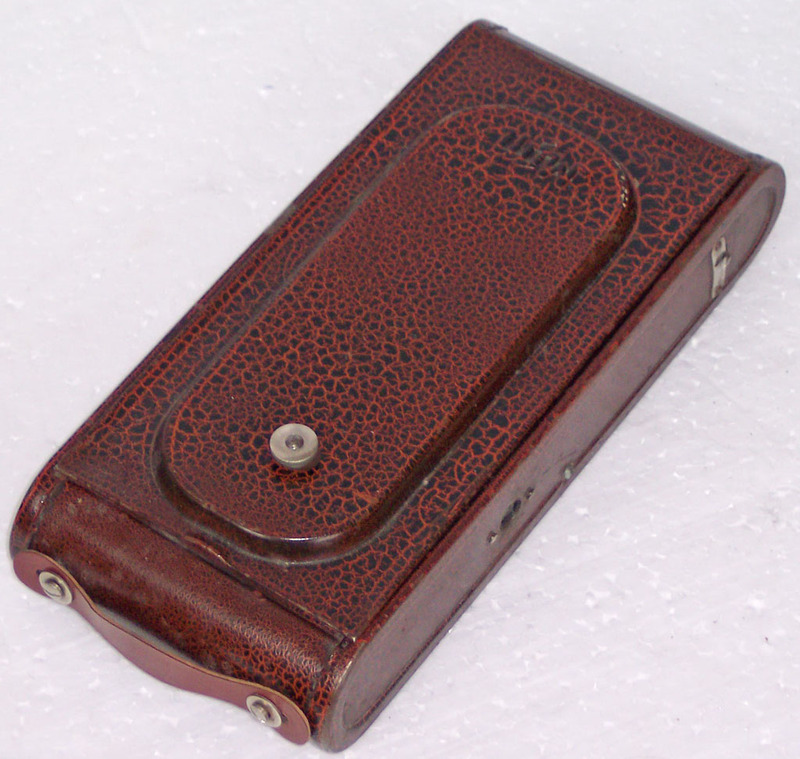 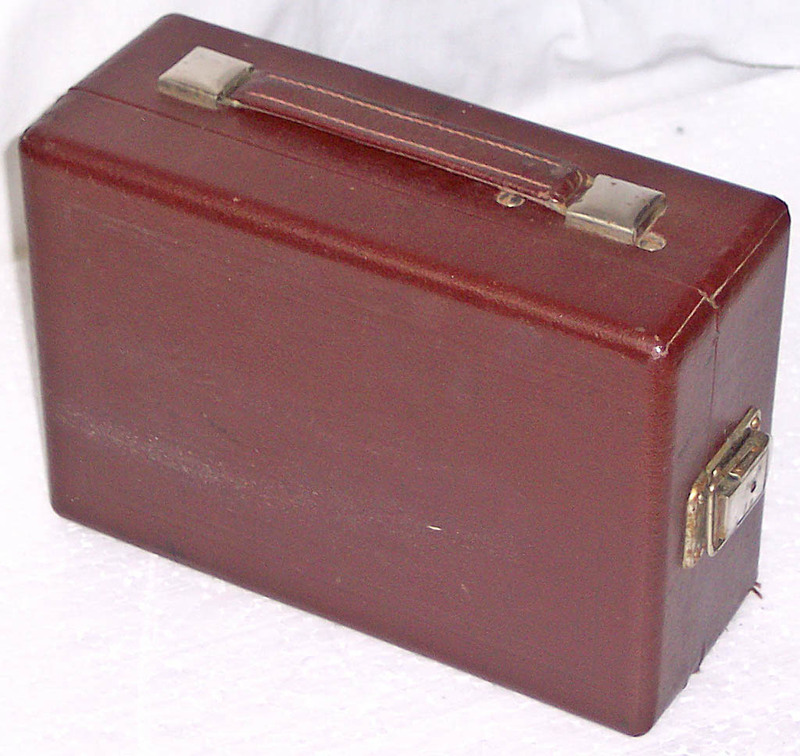 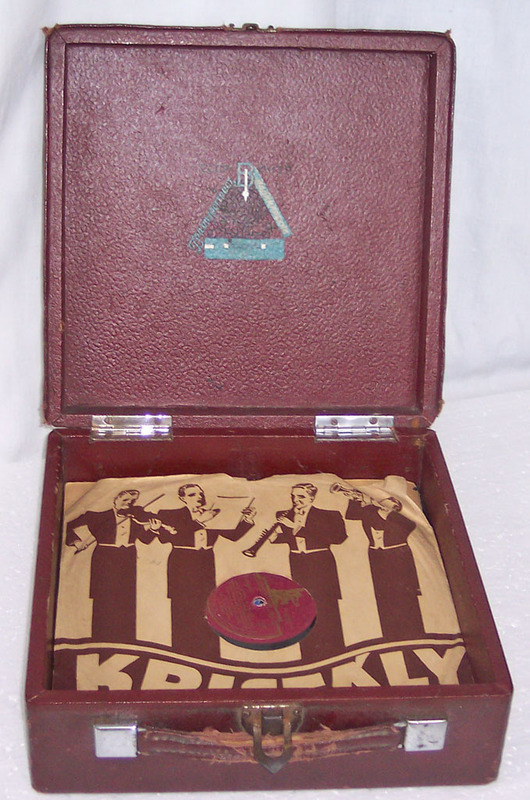 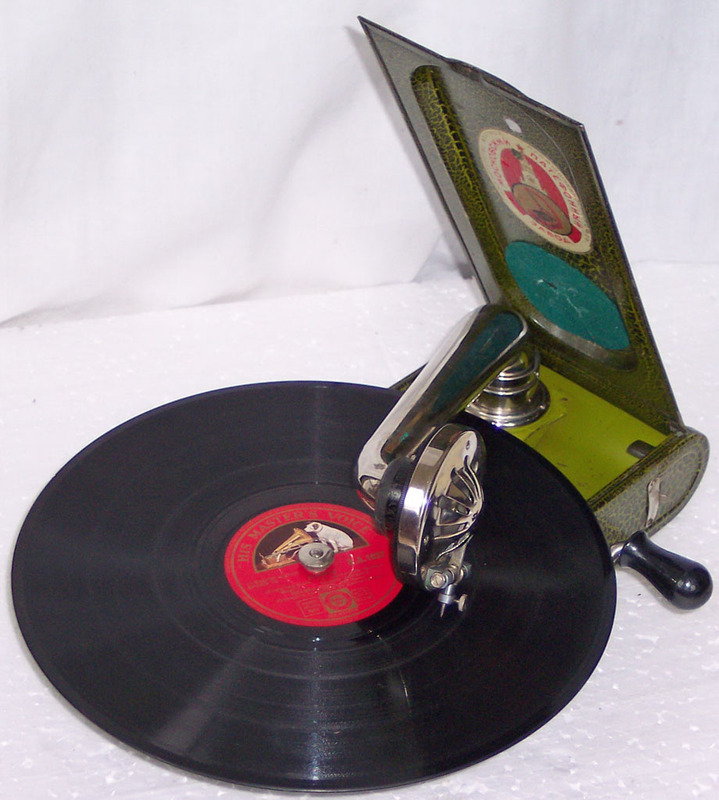 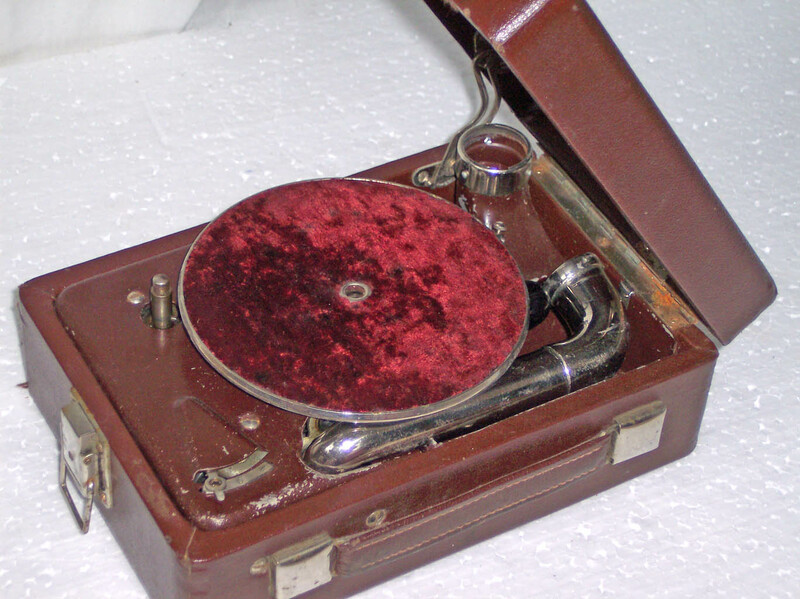 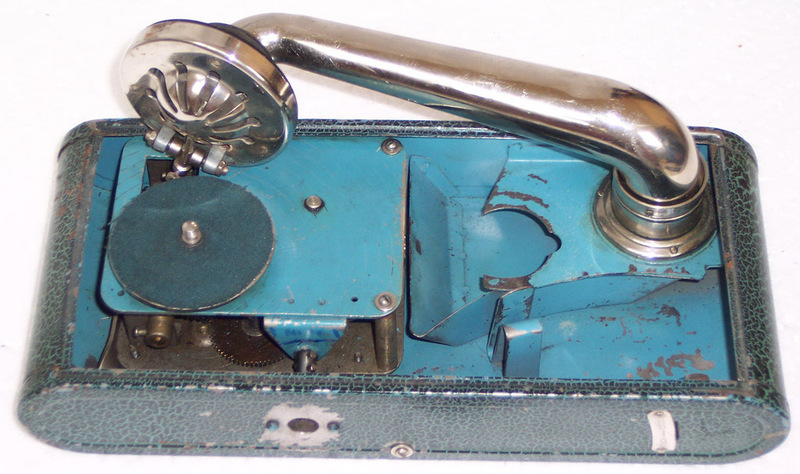 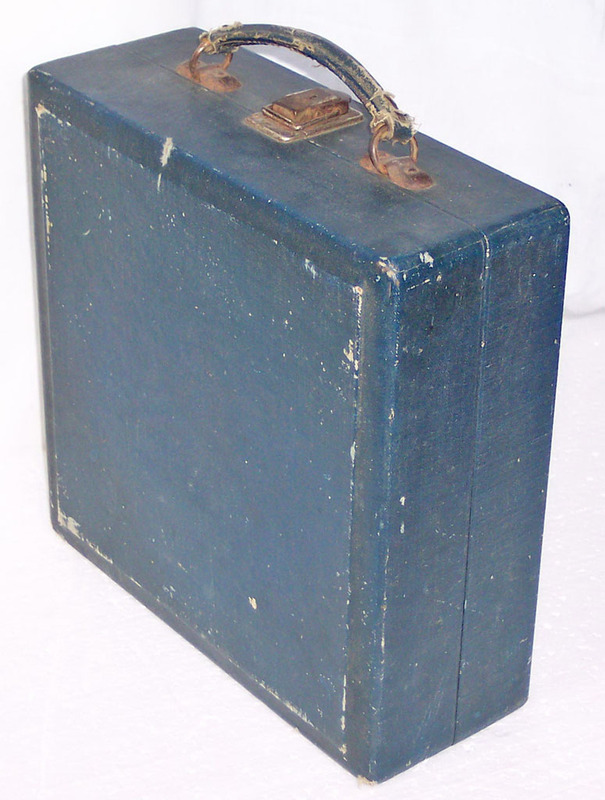 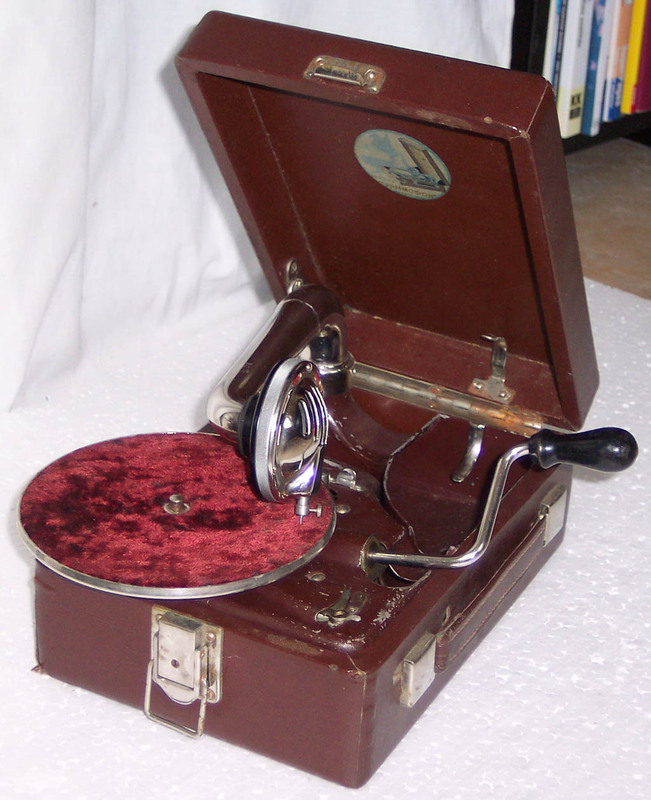 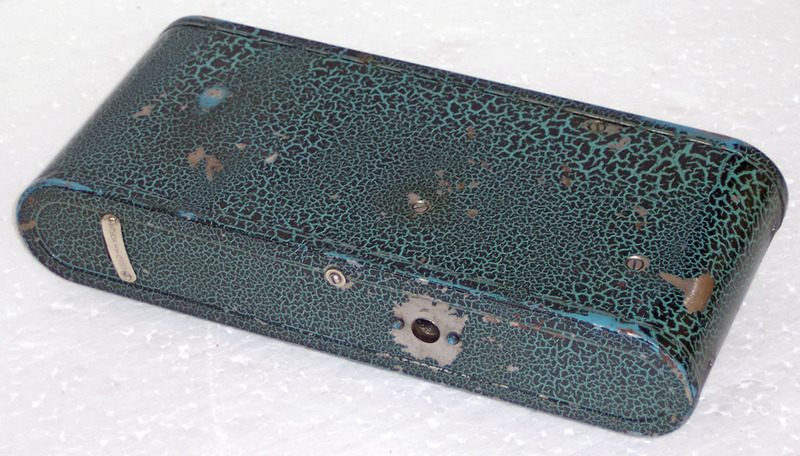 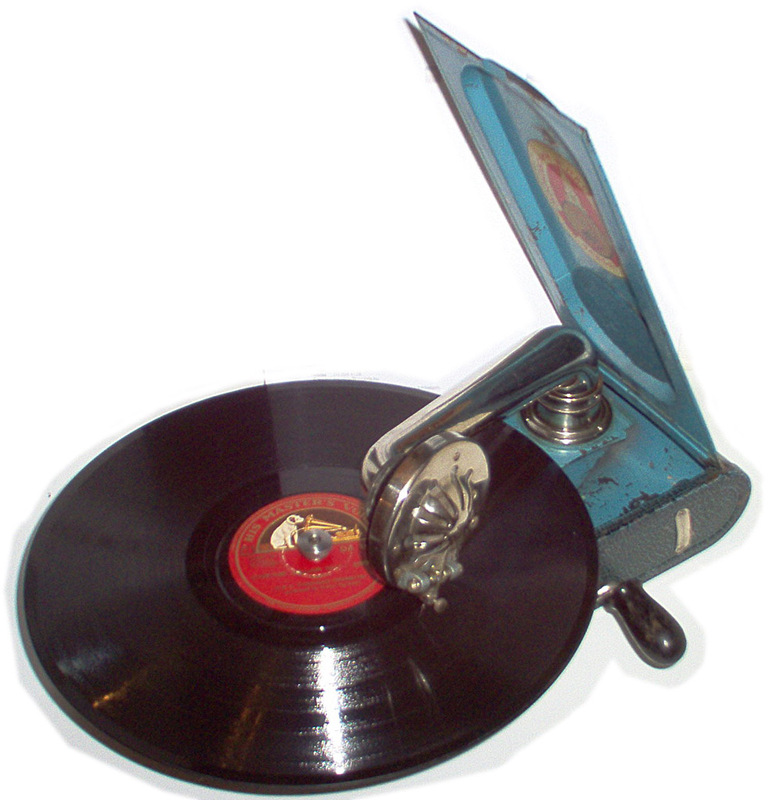 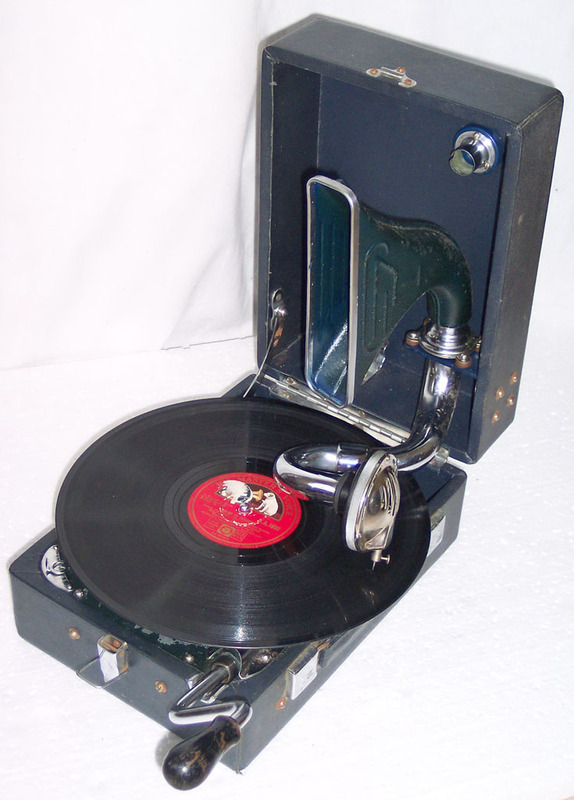 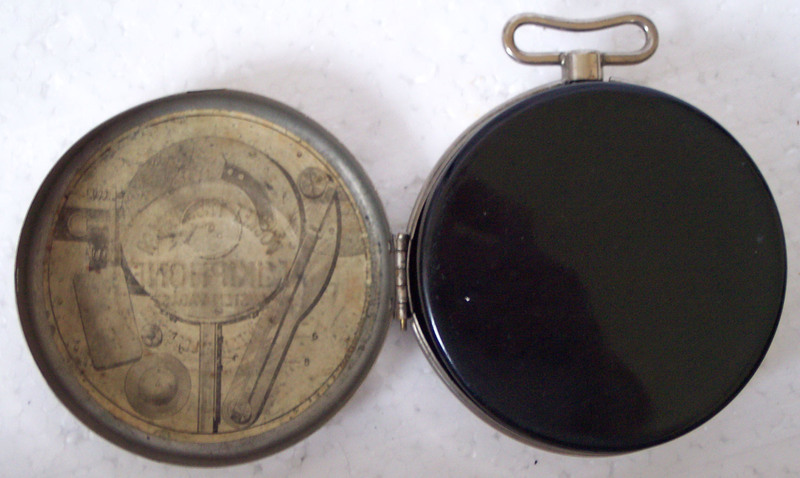 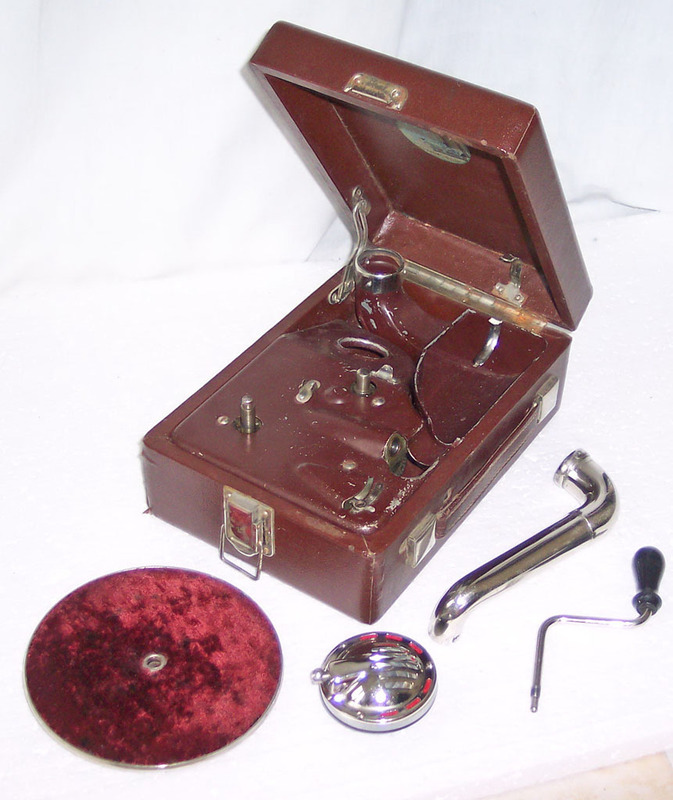 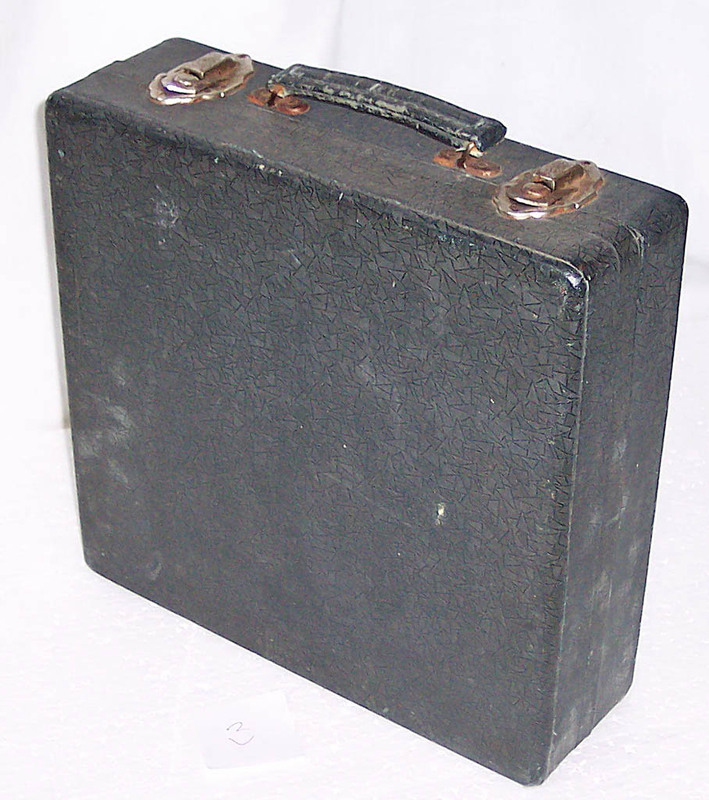 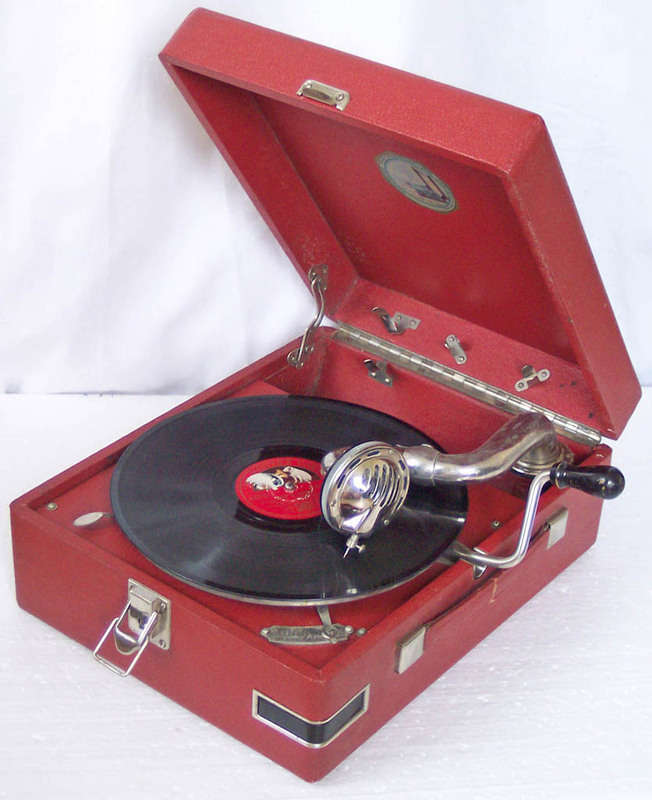 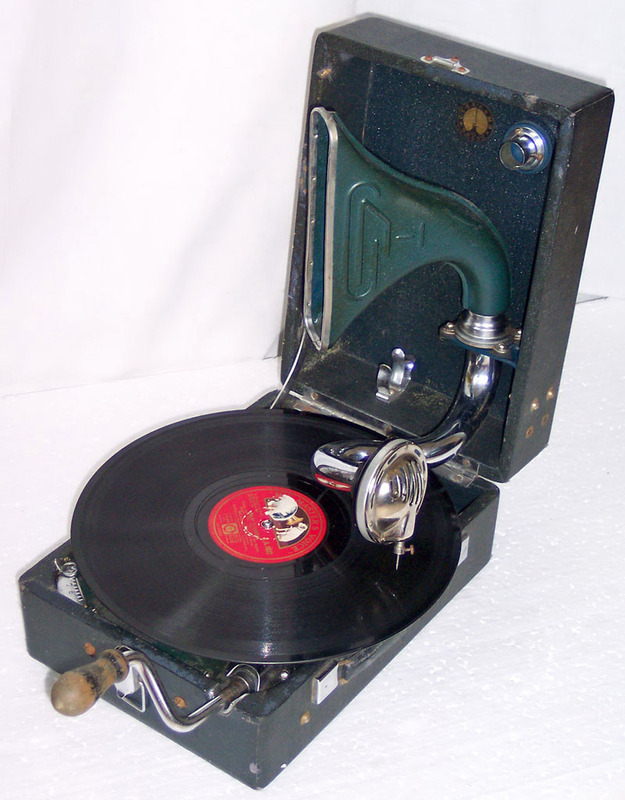 From 1930 till the begining of 1960's in Russia (Sowiet Union) were some fabric that manufactured portable gramophones; at this point "pathéphone" called only them. 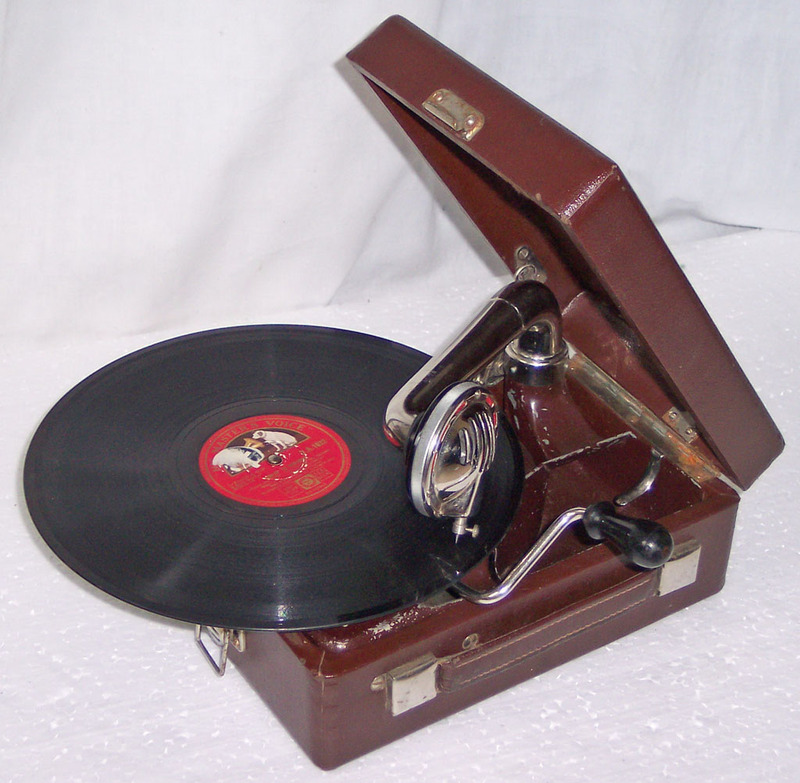 (In the begining of 1960's they were crowded out from market by electrical turntables.) 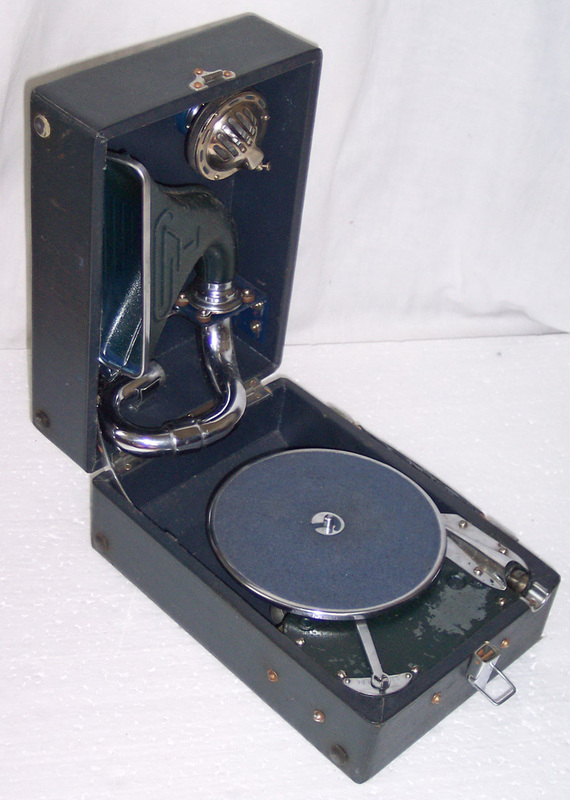 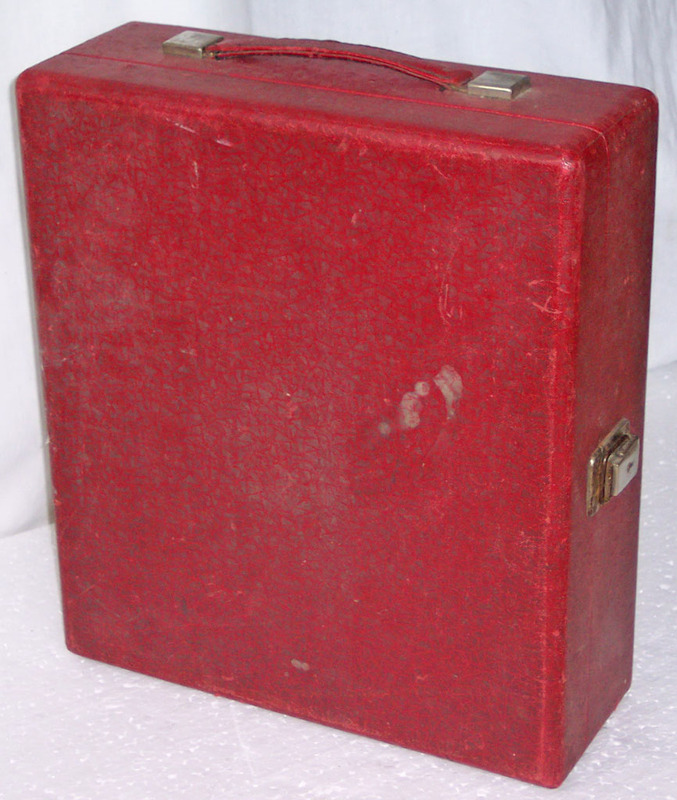 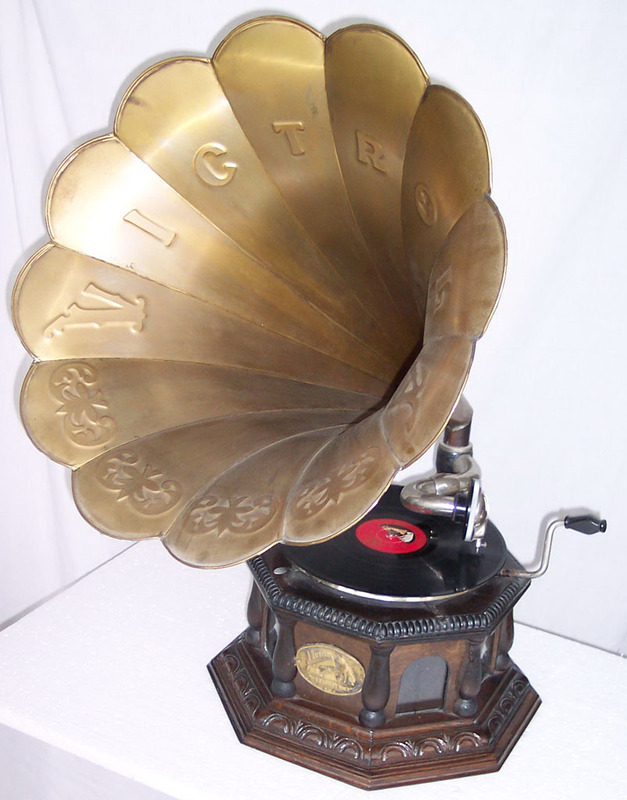 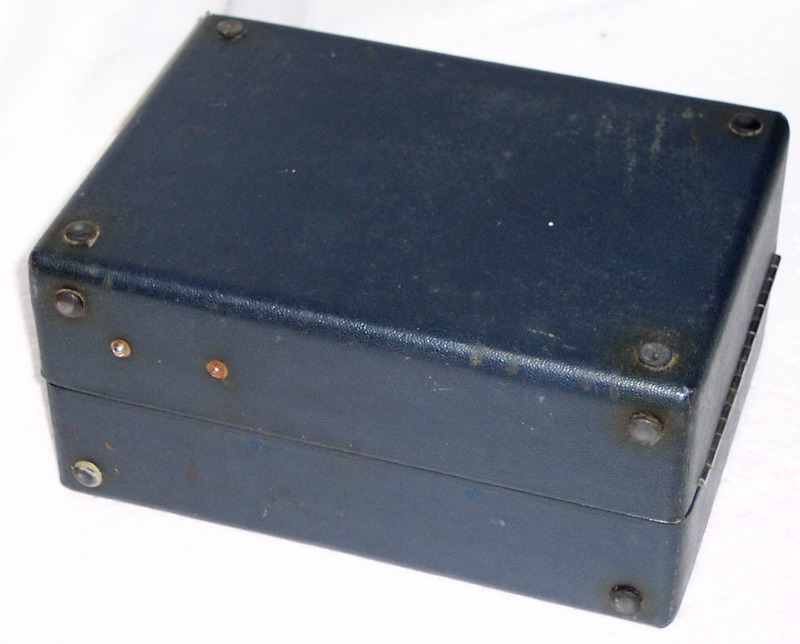 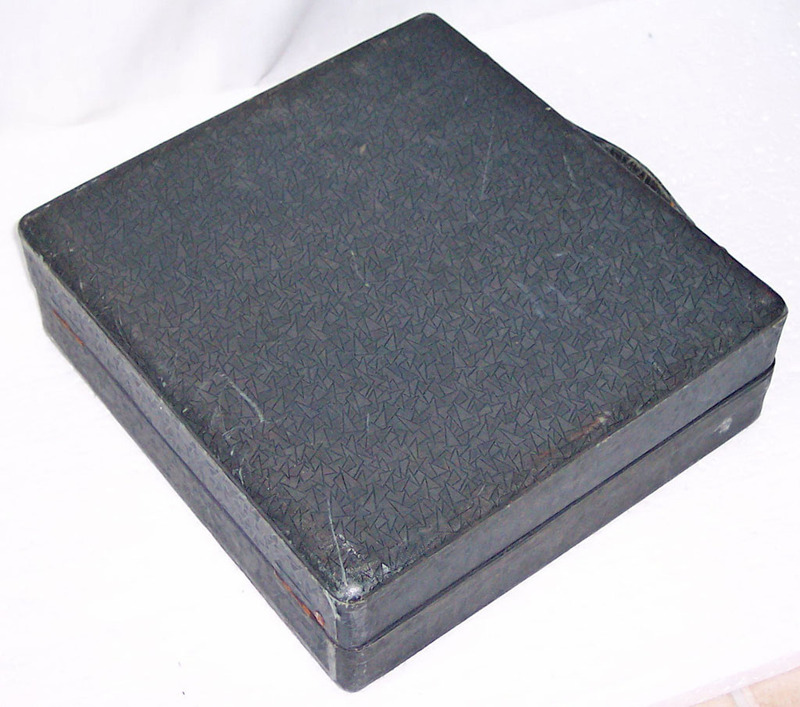 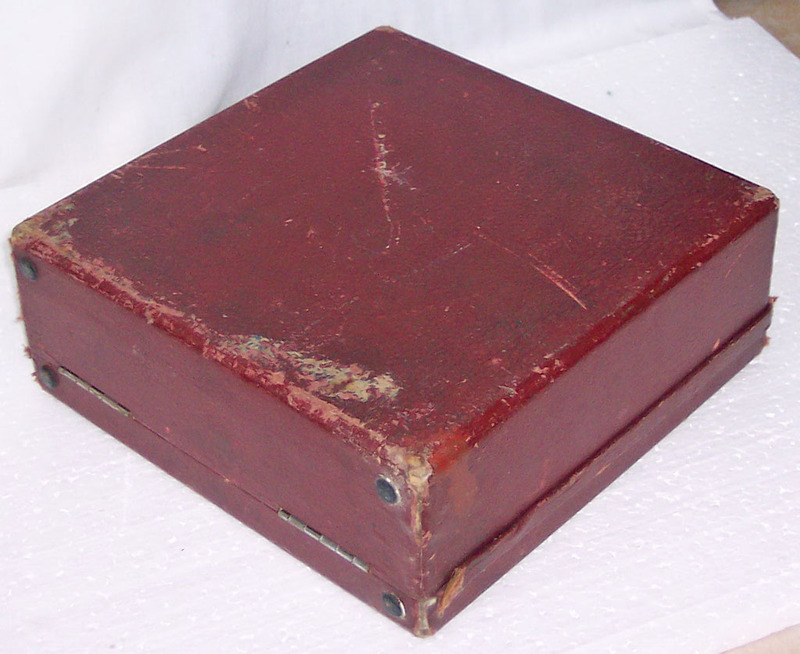 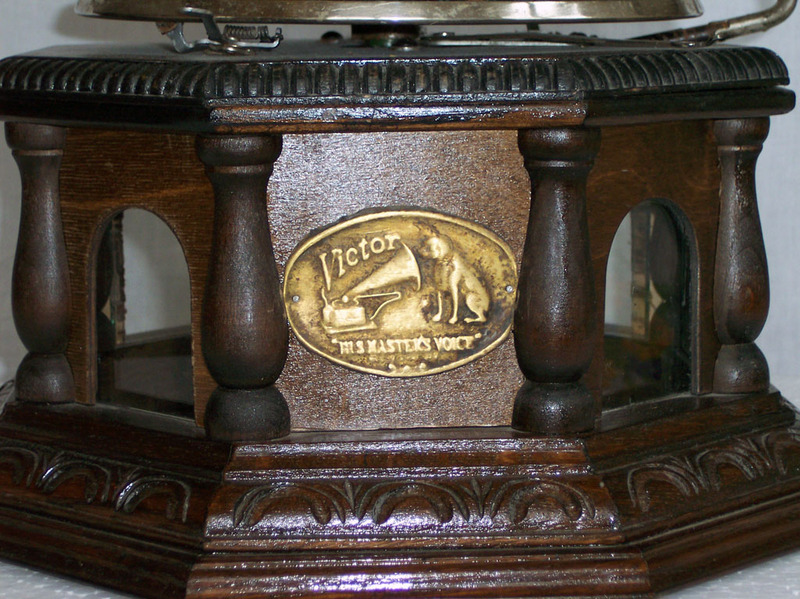 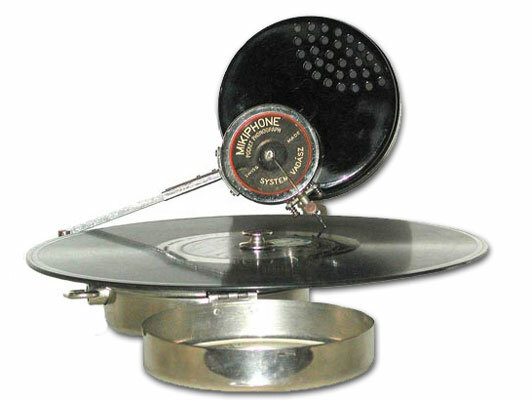 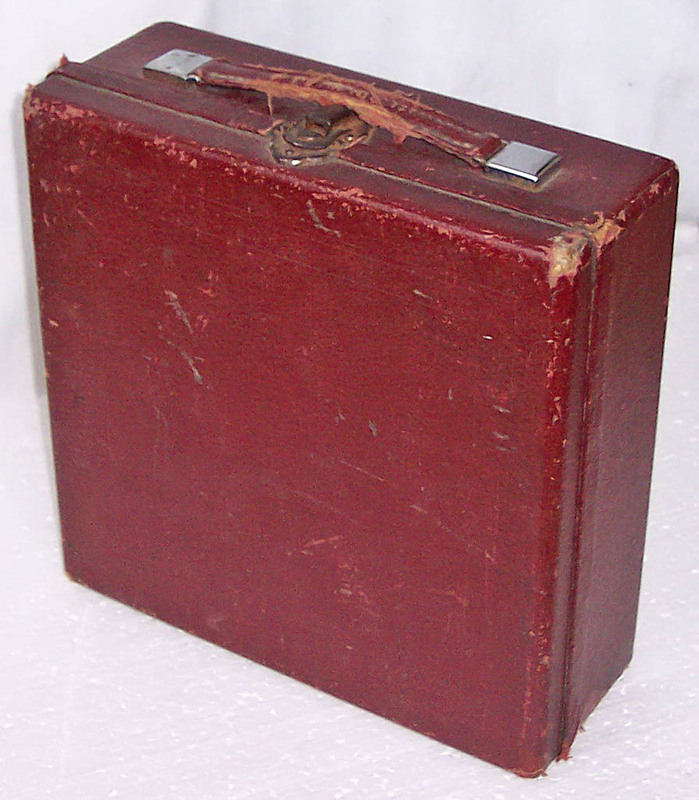 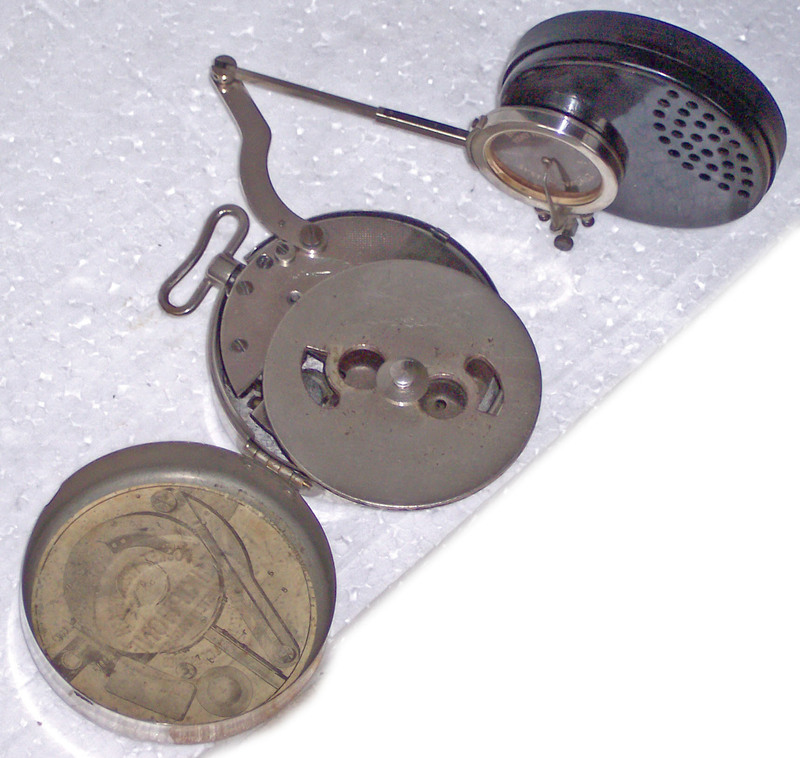 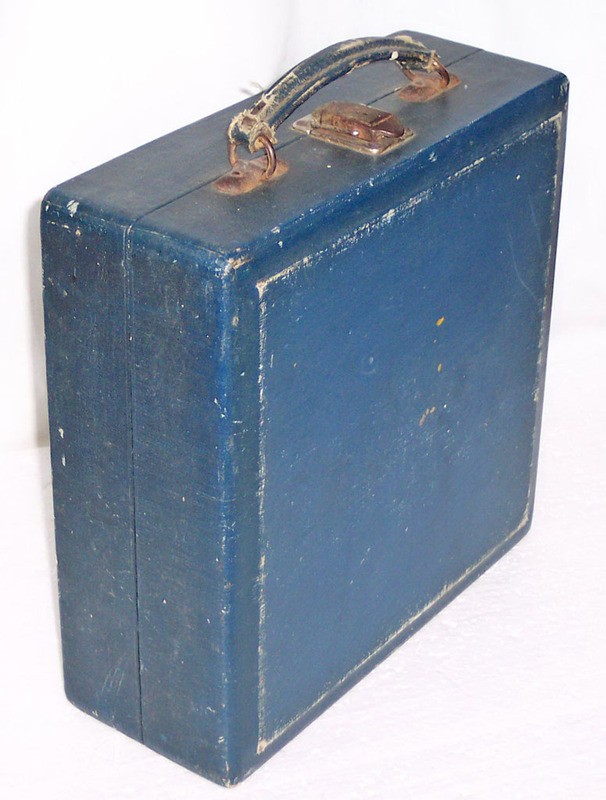 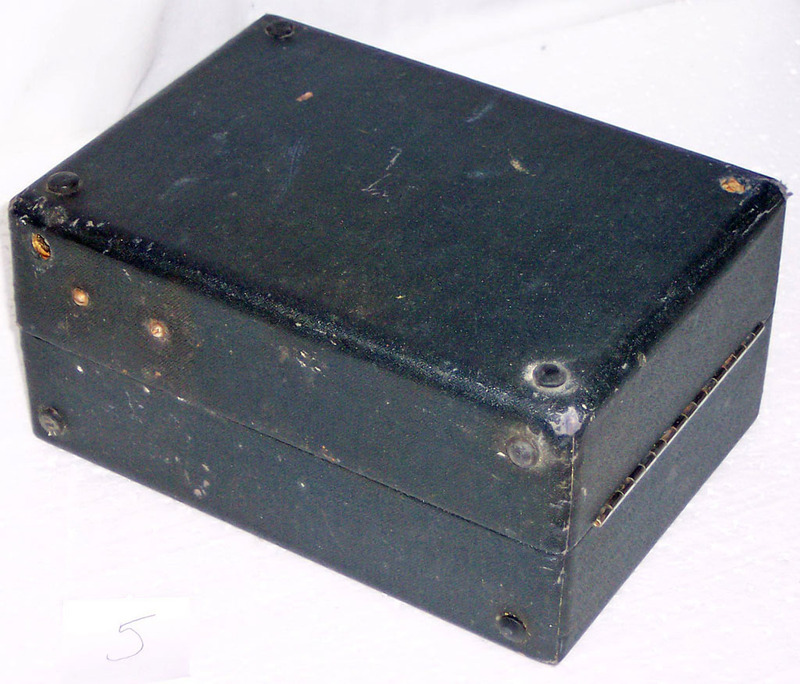 Most (more than 98 %) of production were potable gramophones with 34-42 cm lenght. 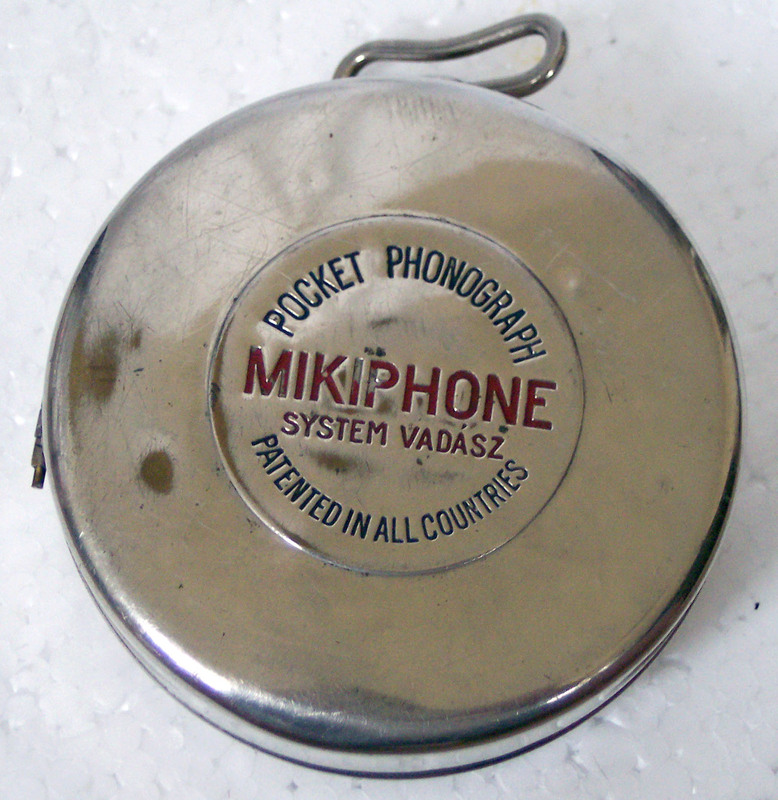 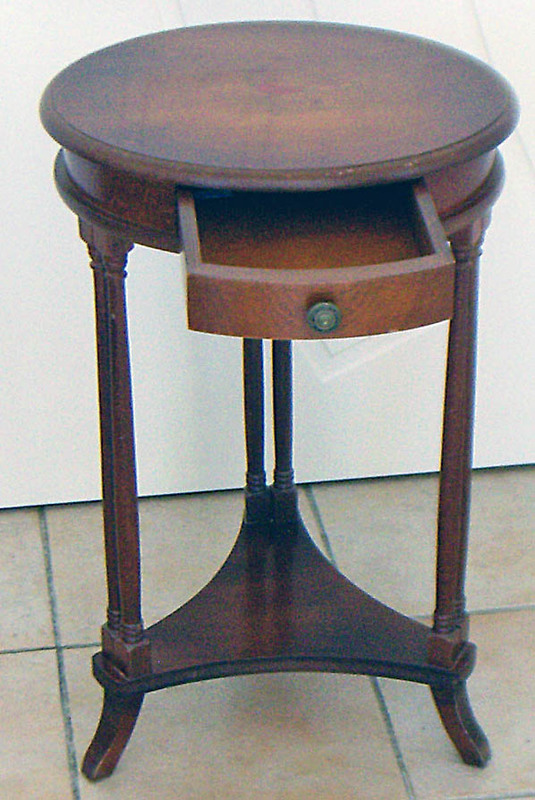 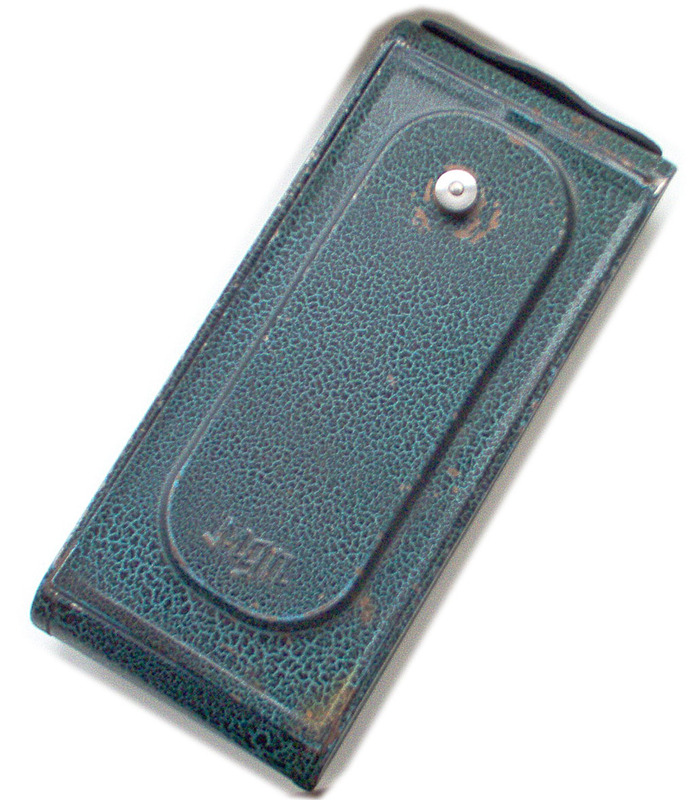 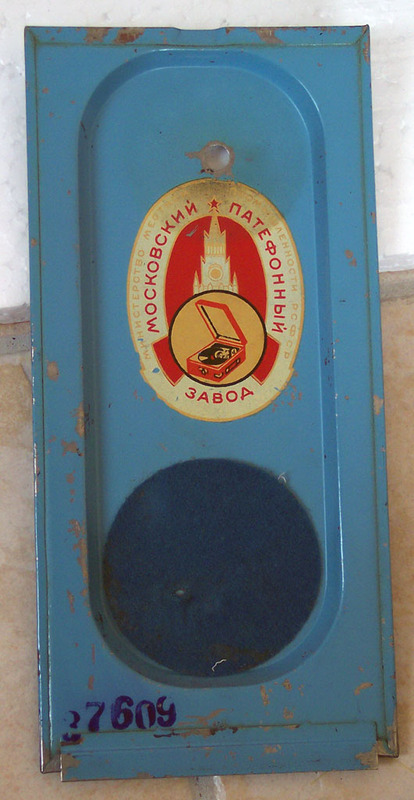 Patéphones with less sizes were produced only for special needs (for example, Malyutka for officers), in small amounts. 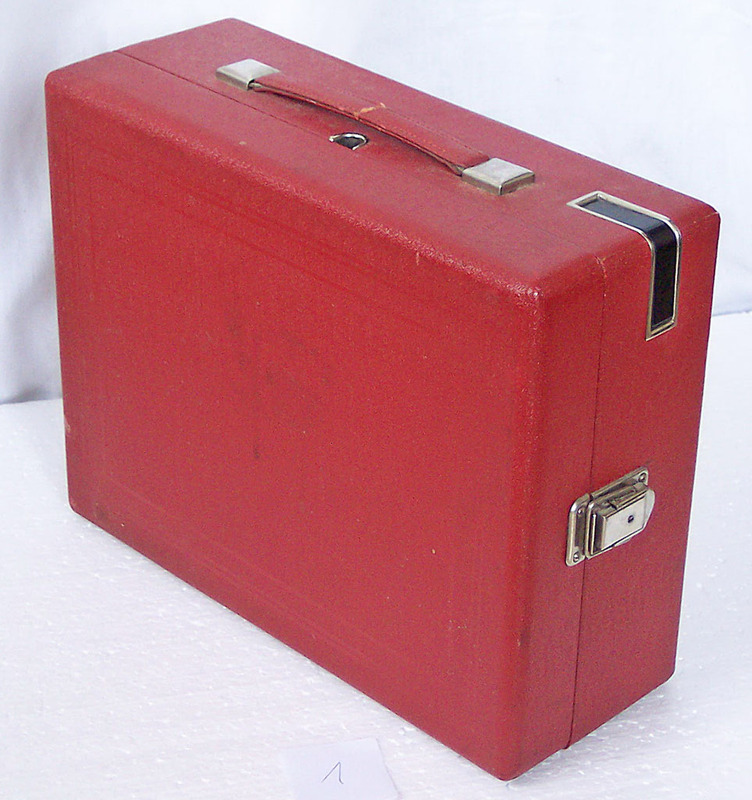 So they are rare on antic market (and very rare if in good condition) and are some times more expensive than bigger, usual one's. 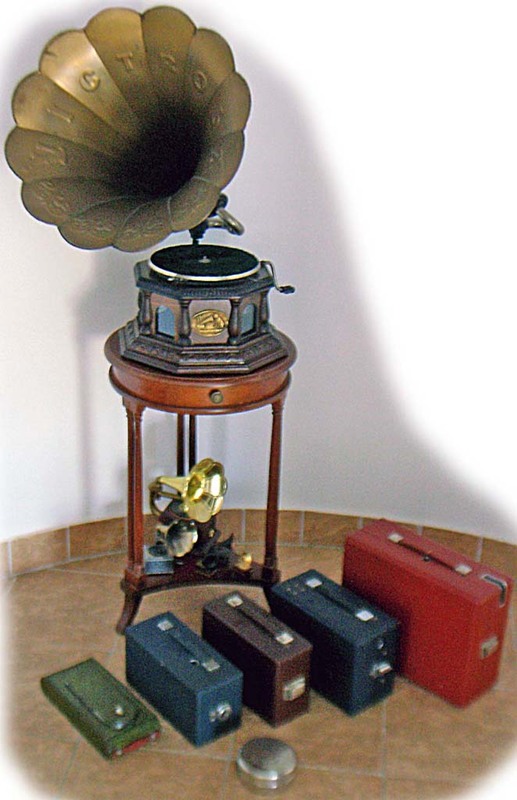 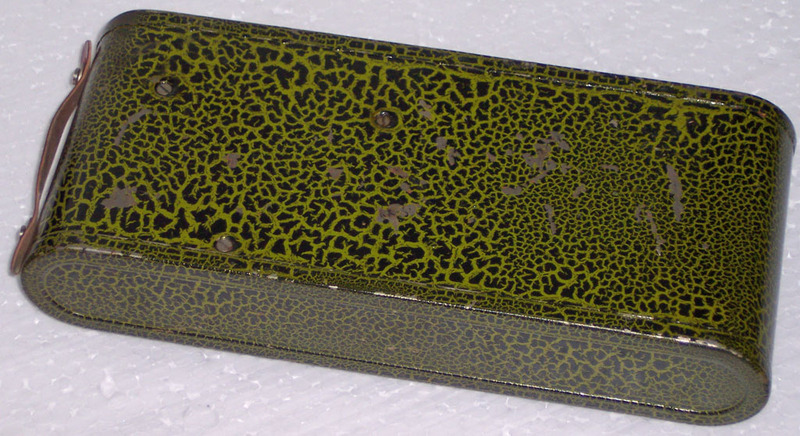 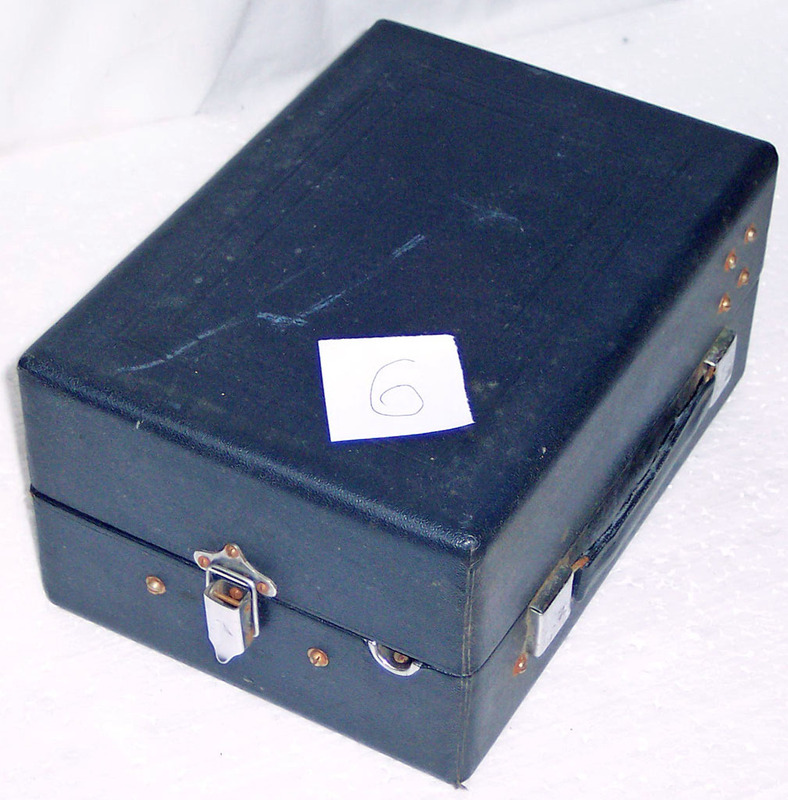 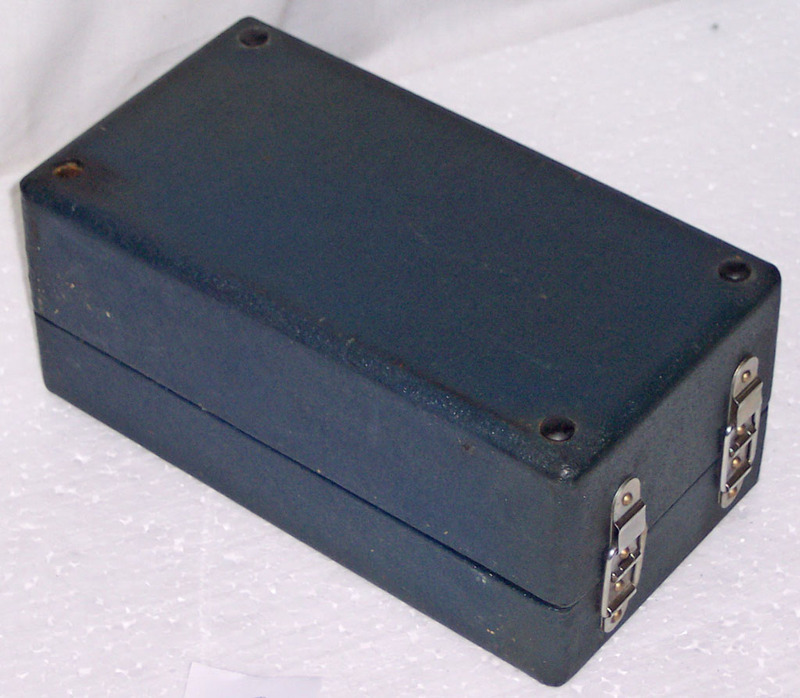 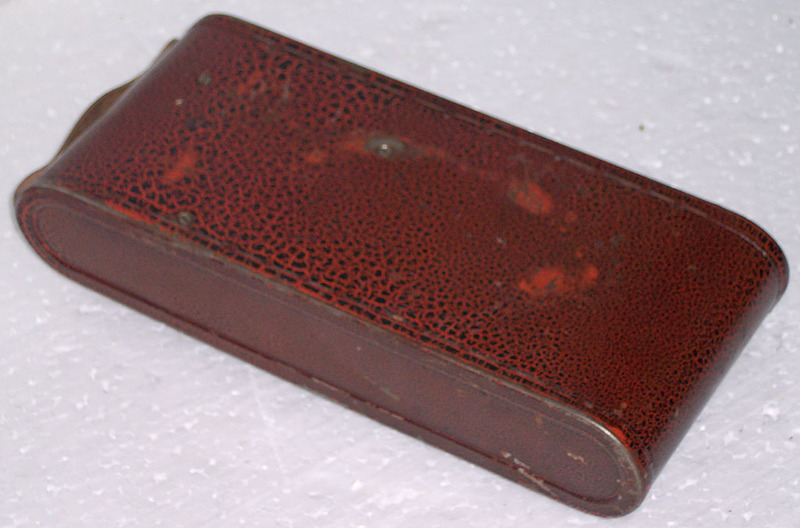 I was busied 7 years with Russian portable gramophones (pathéphones) and meeted about 150 pieces of little size, rare one's. 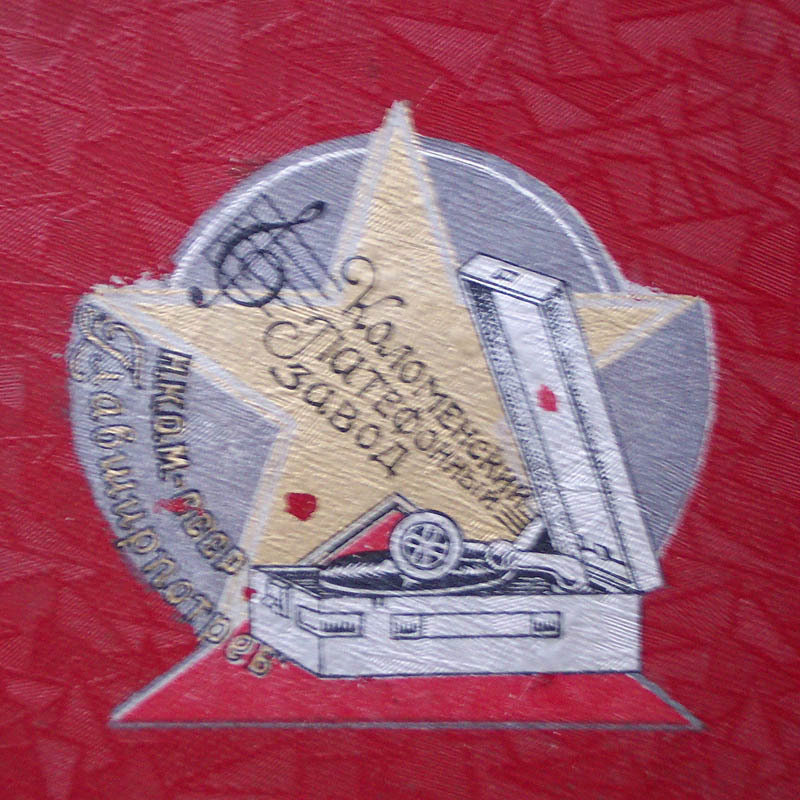 I selected the best of them to my collection. 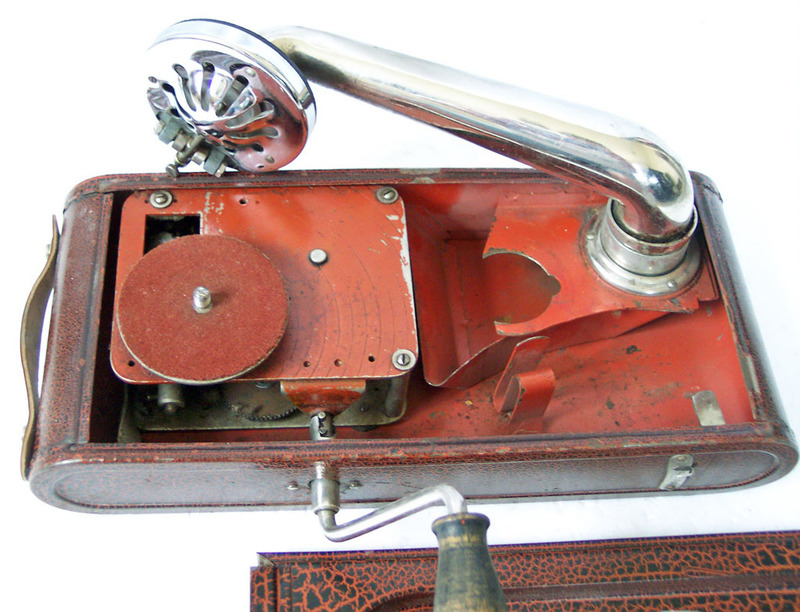 Pathéphones are 50-80 years old. 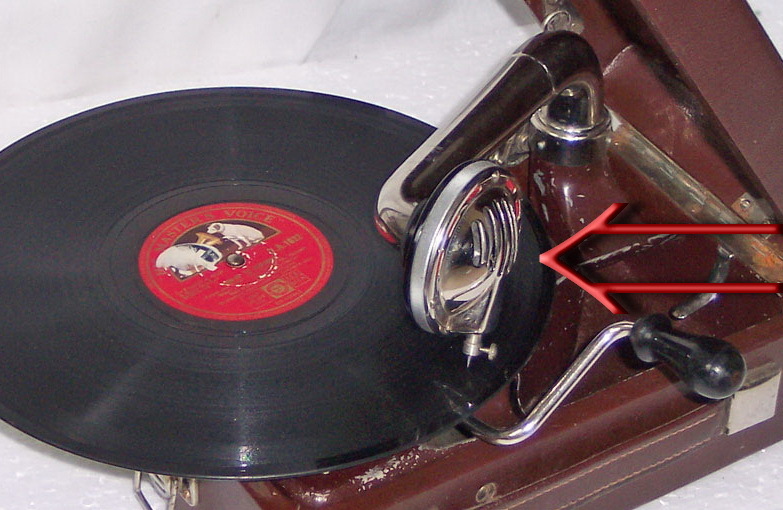 For this long time most of them became defected (if were endured at all). 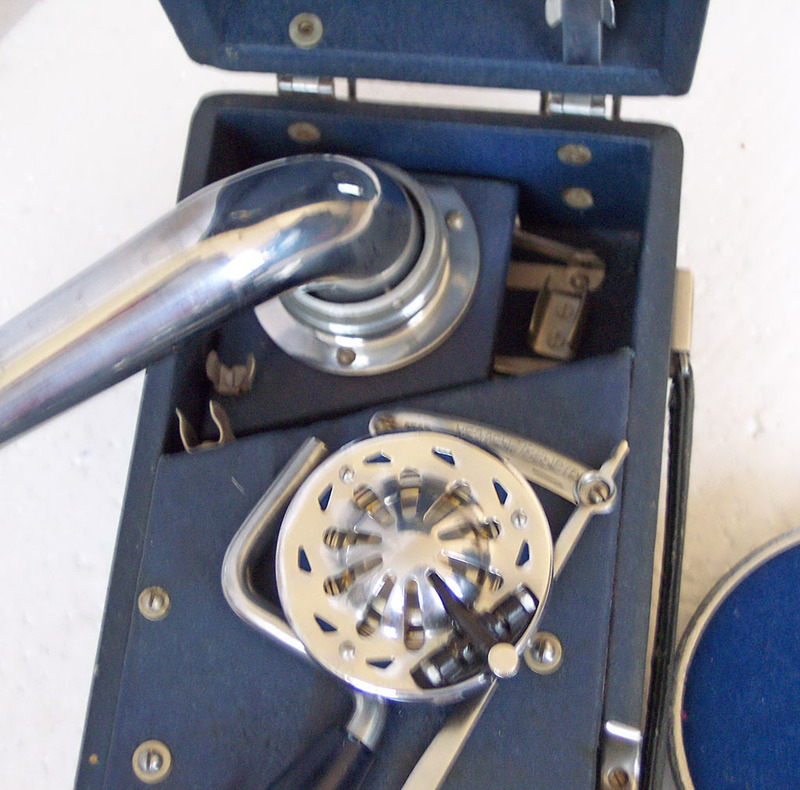 Tired spring — speed will not constant, the sound will "mew", distorted; at all, spring may not be able to play whole disk side at one winding. 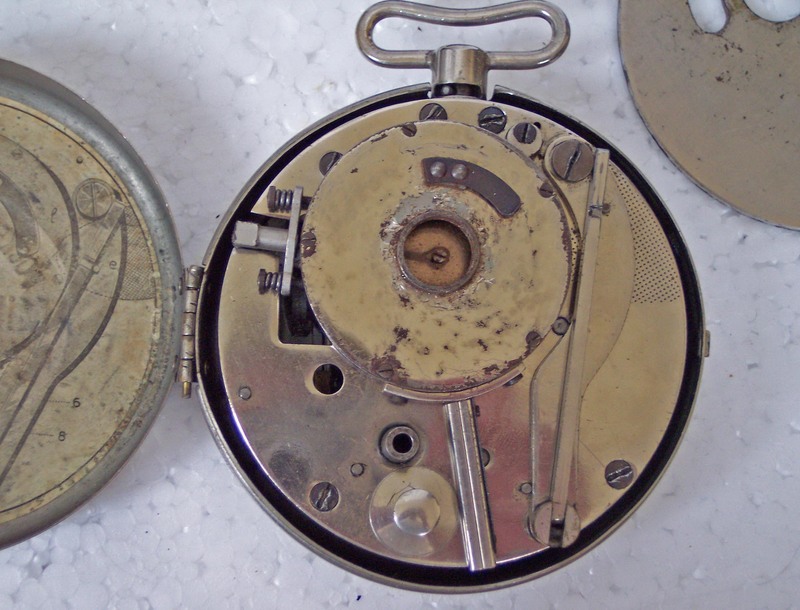 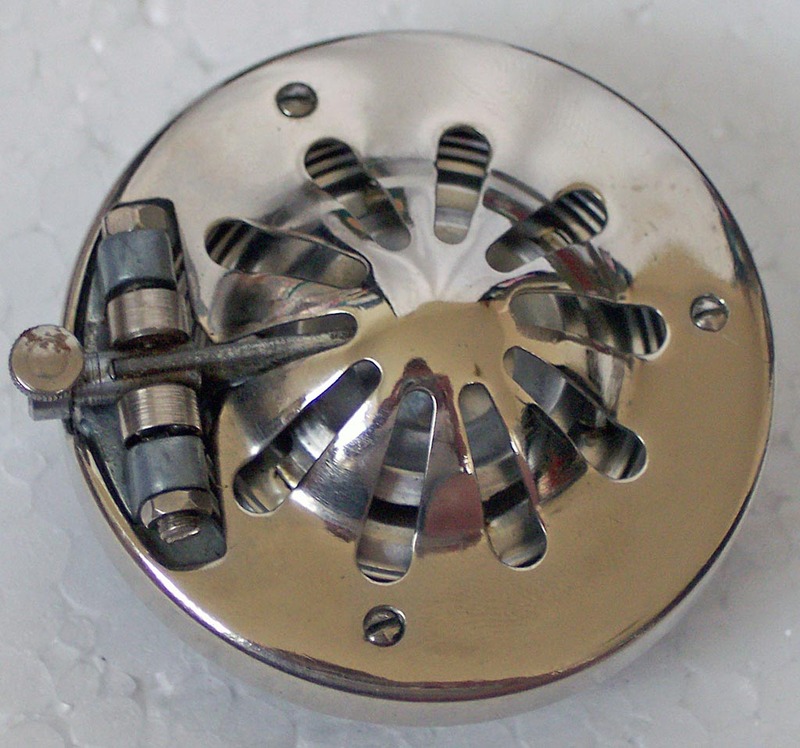 The flyweights of speed-controll mechanism (made from soft metall) are cracked or failed 1-2 of 3 pieces — the same effect, plus the speed will "crawl" down or up, will not hold the wanted value. 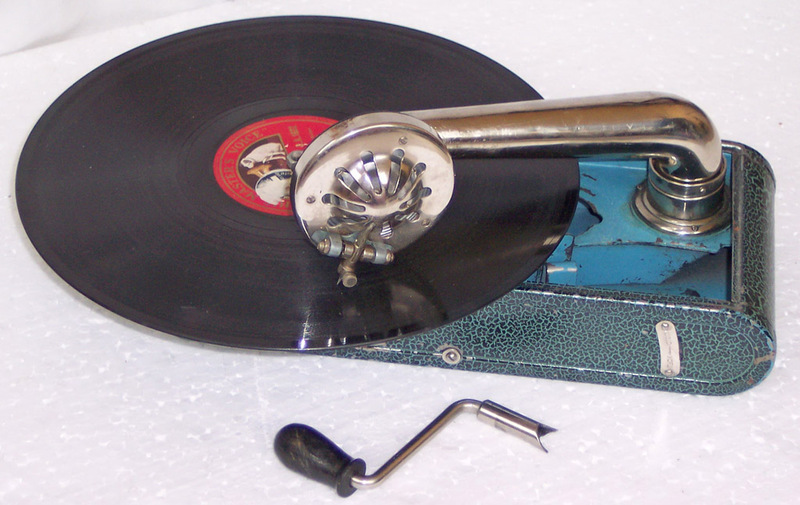 The tone-arm's balls are rusty or defected — it can't exactly follow the disk's channel, the needle flounces, break the disk. 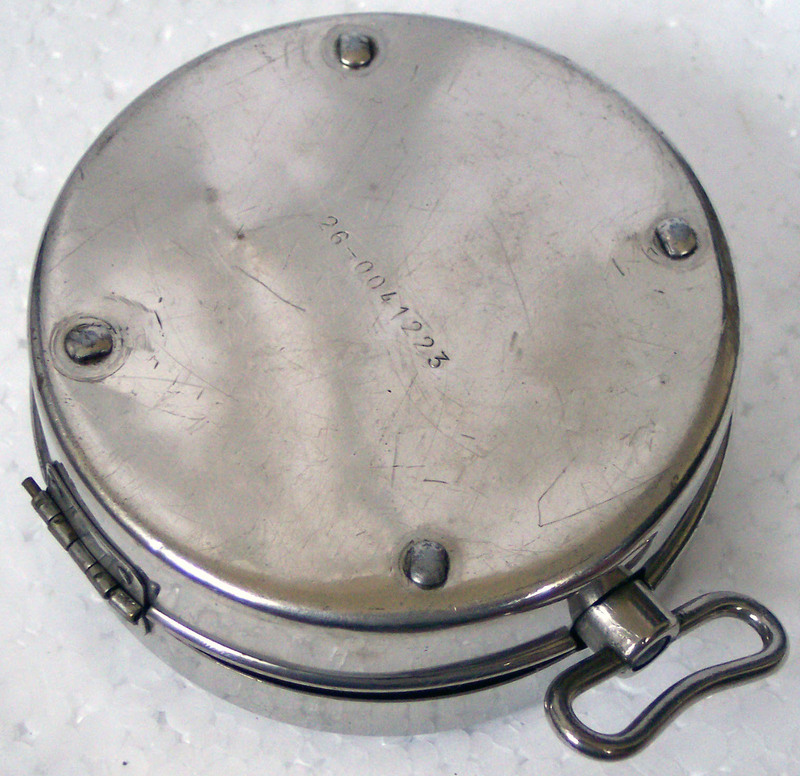 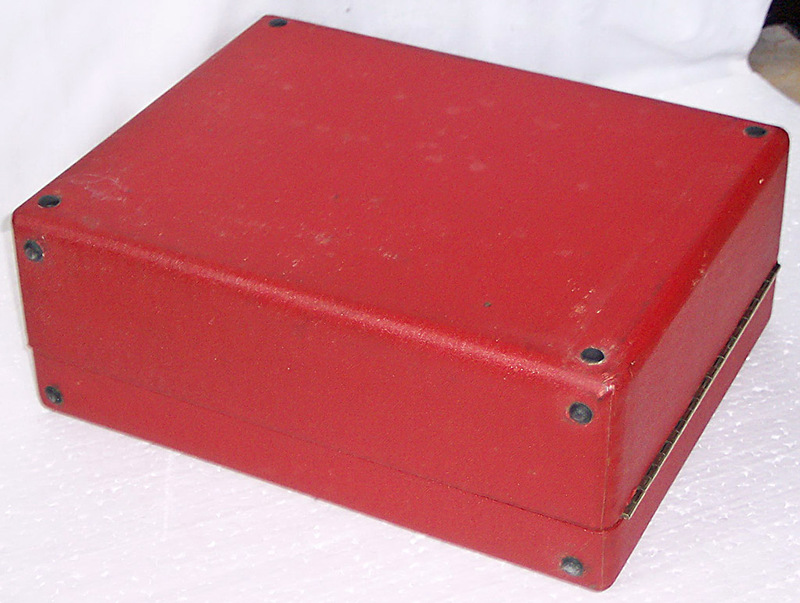 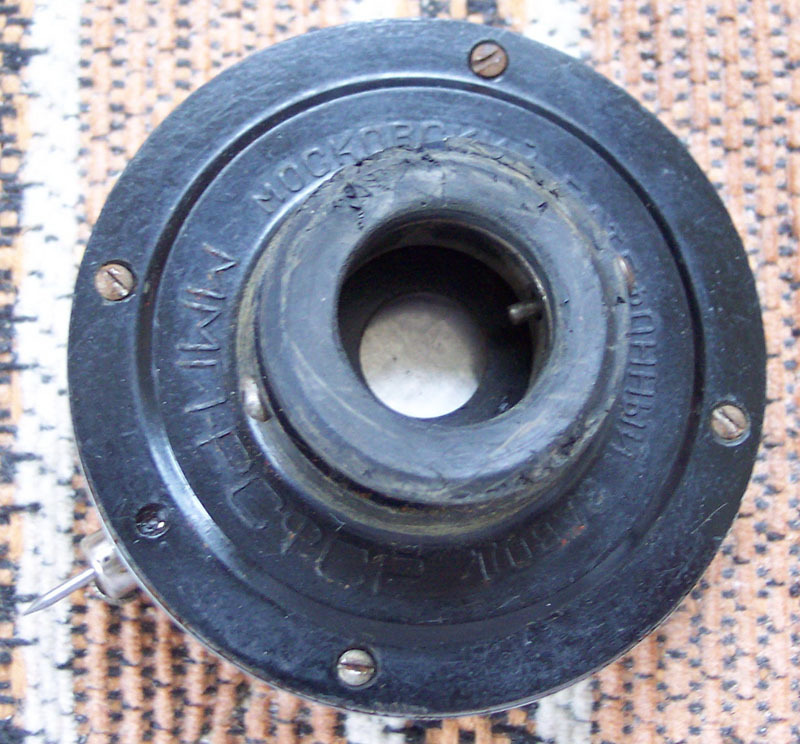 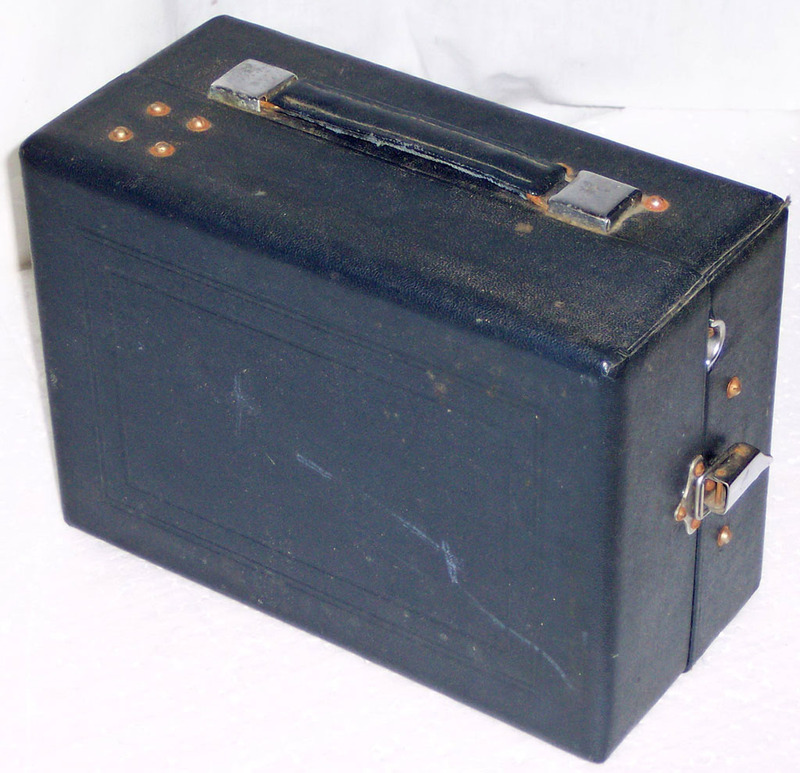 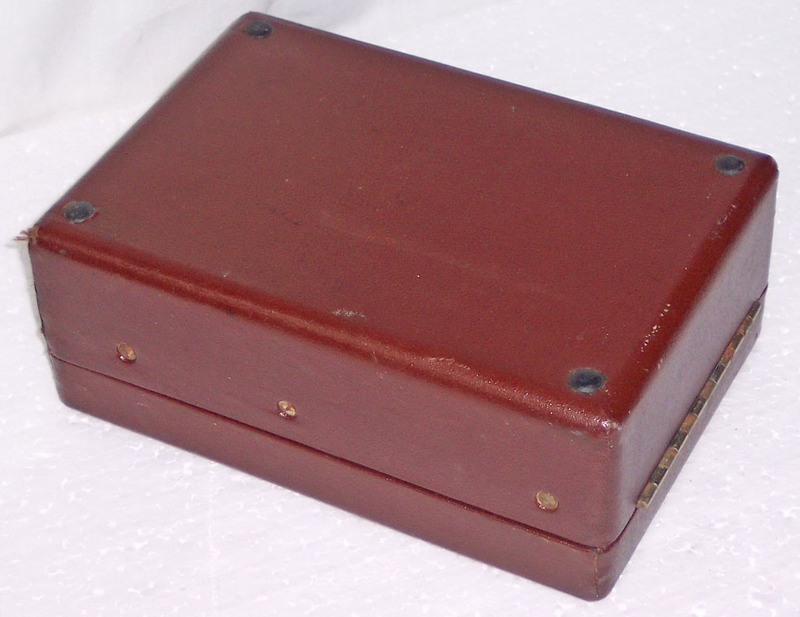 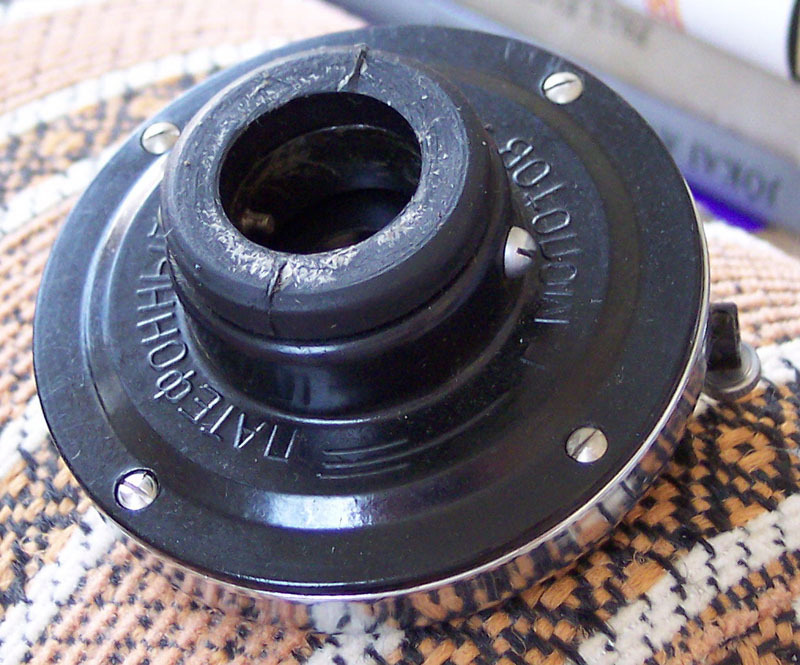 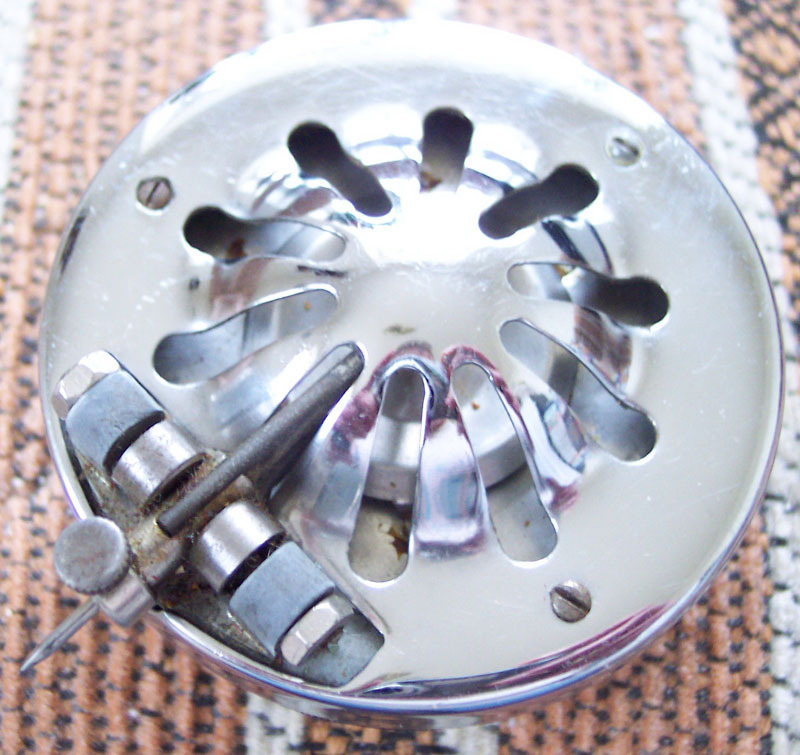 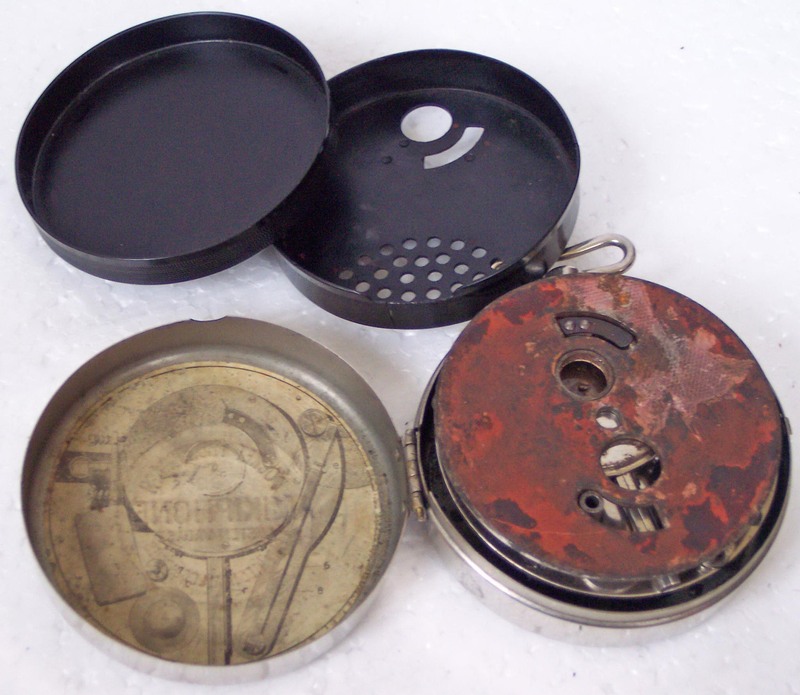 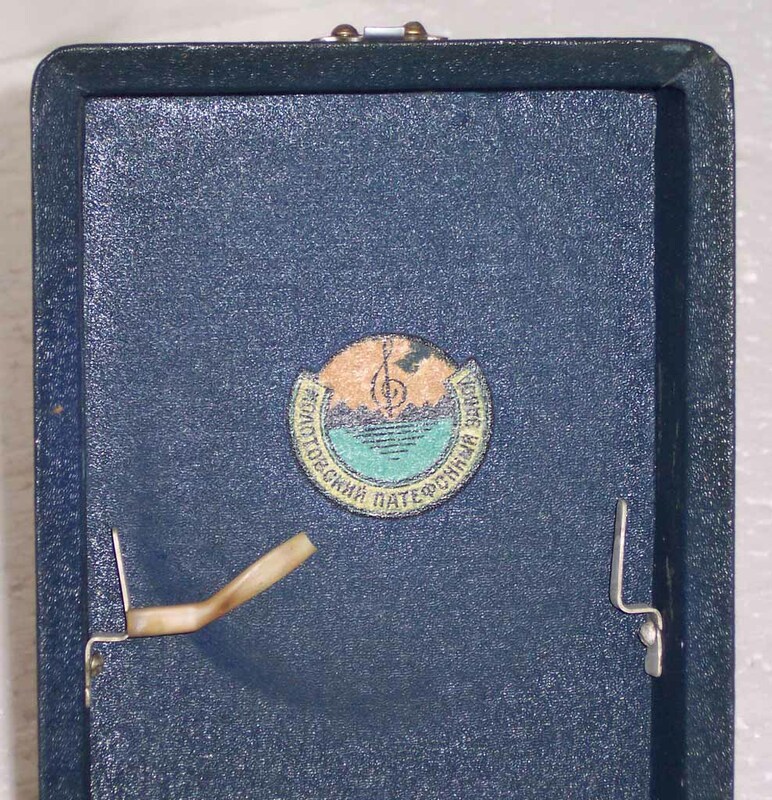 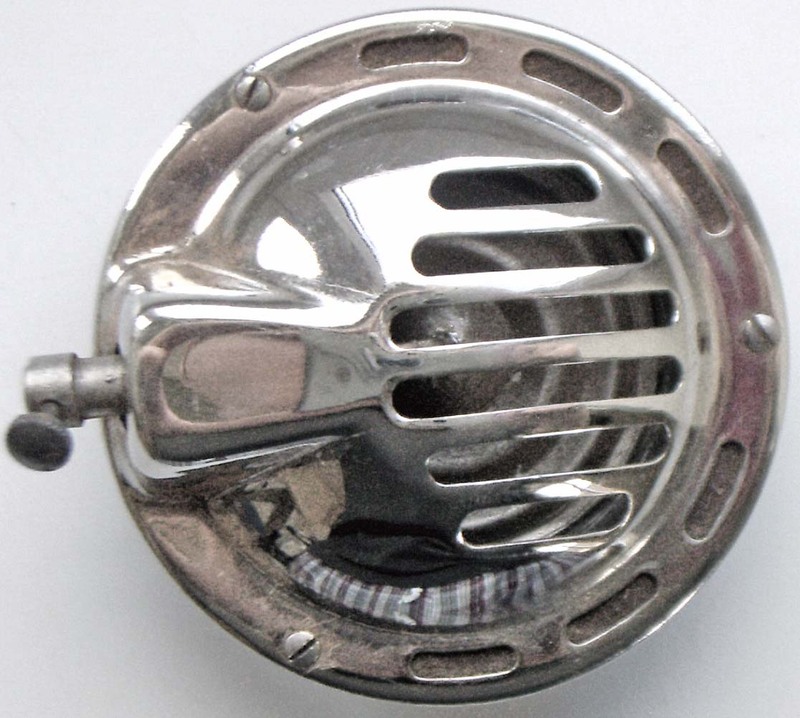 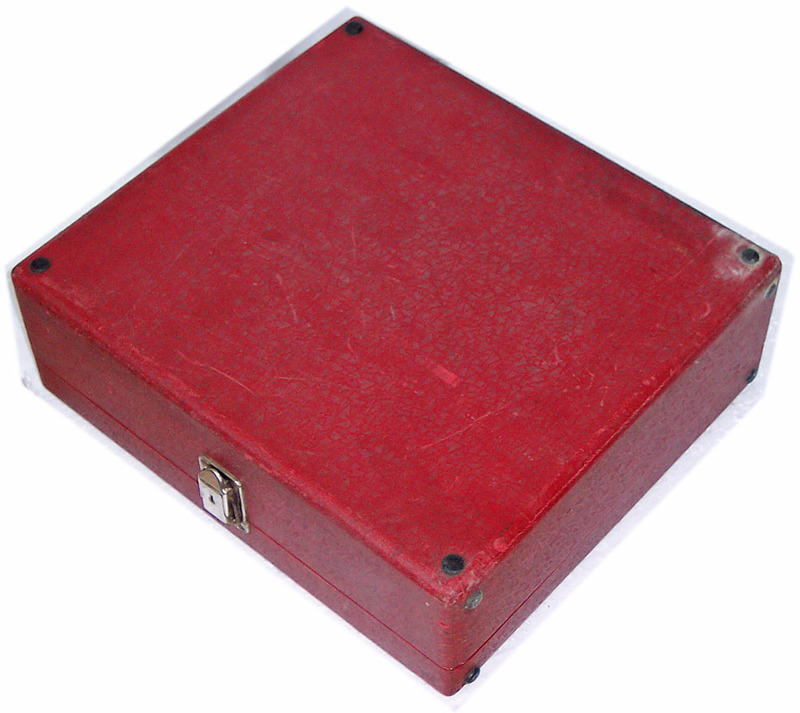 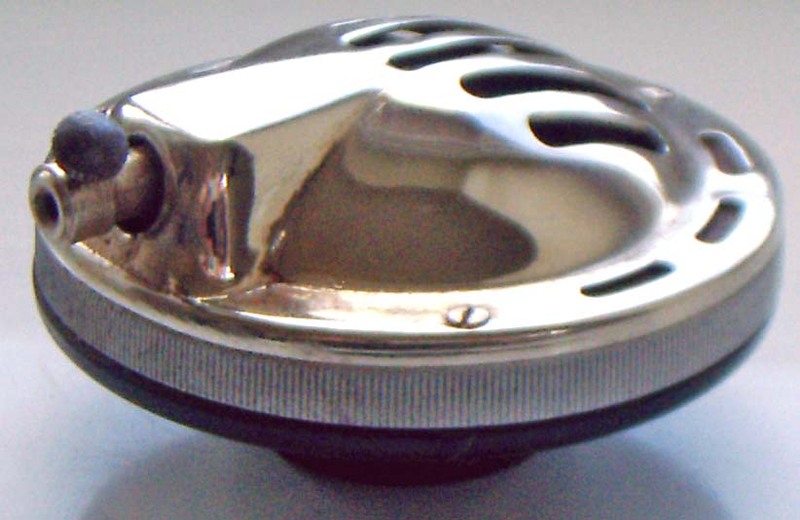 The diaphragm of sound box is breaked — sound is quiet and hawky. 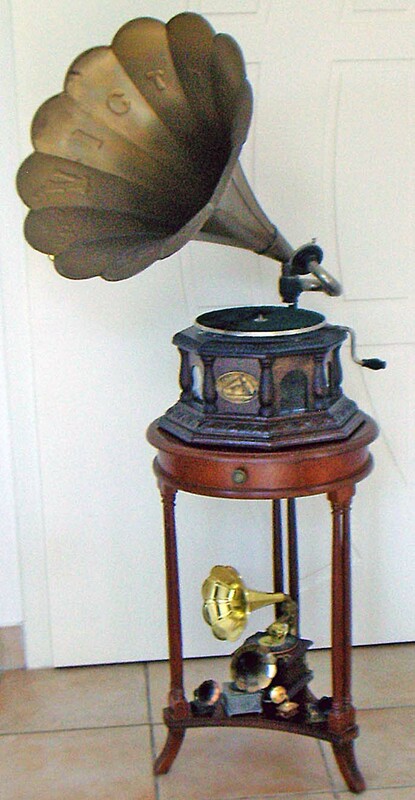 And so on… Of course these defects may restored, but assuming know-how, time and money; and repaired gramophones are not original in 100 %. 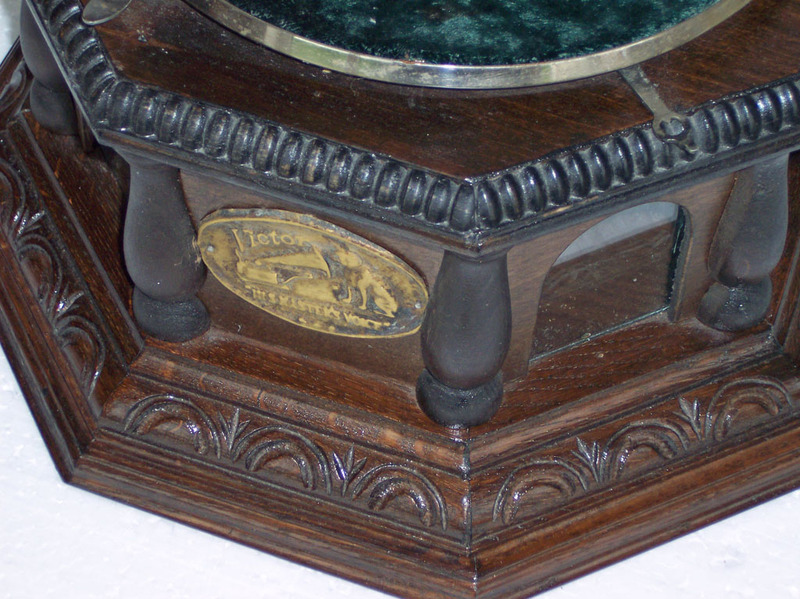 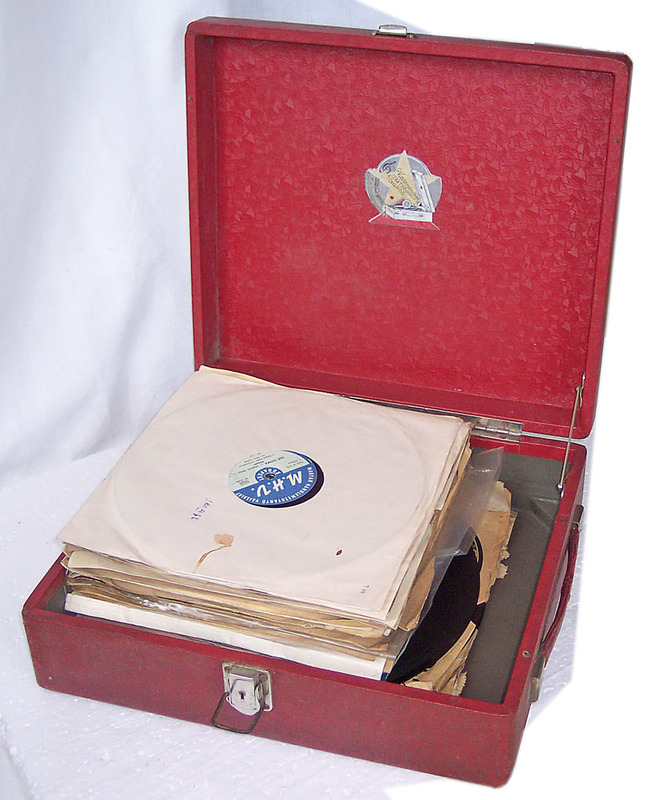 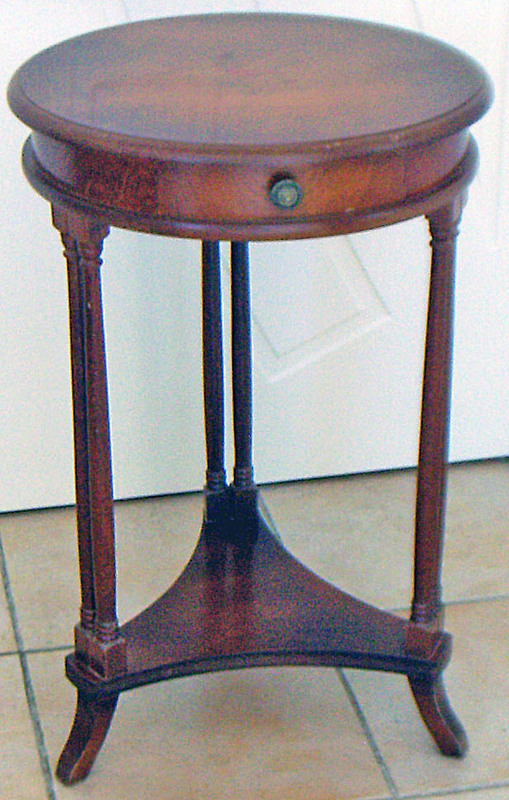 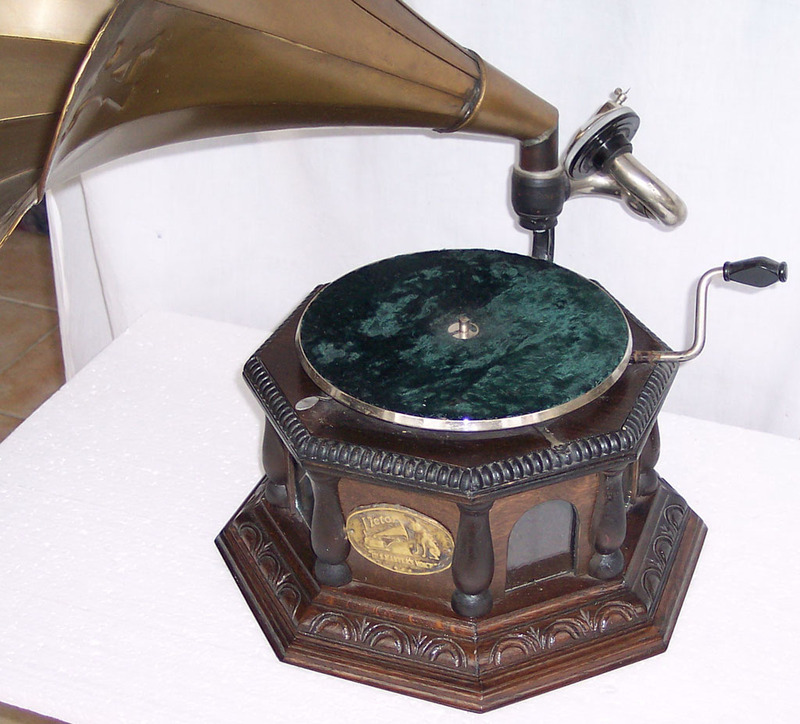 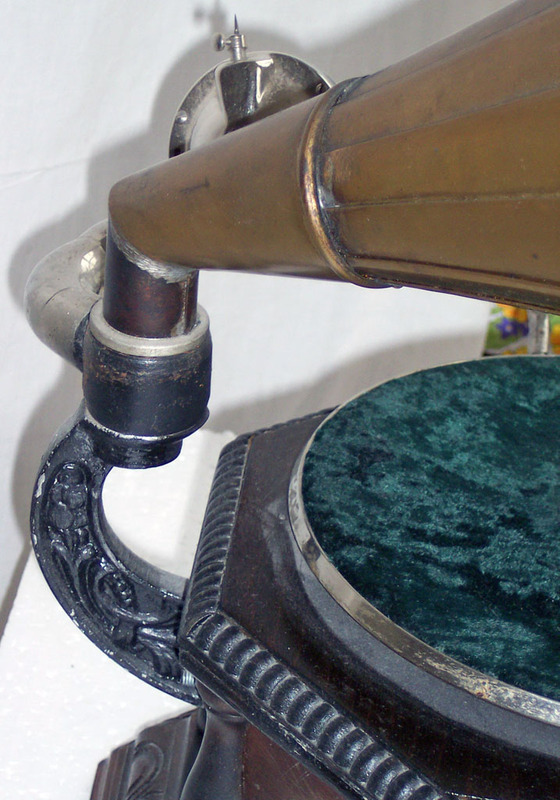 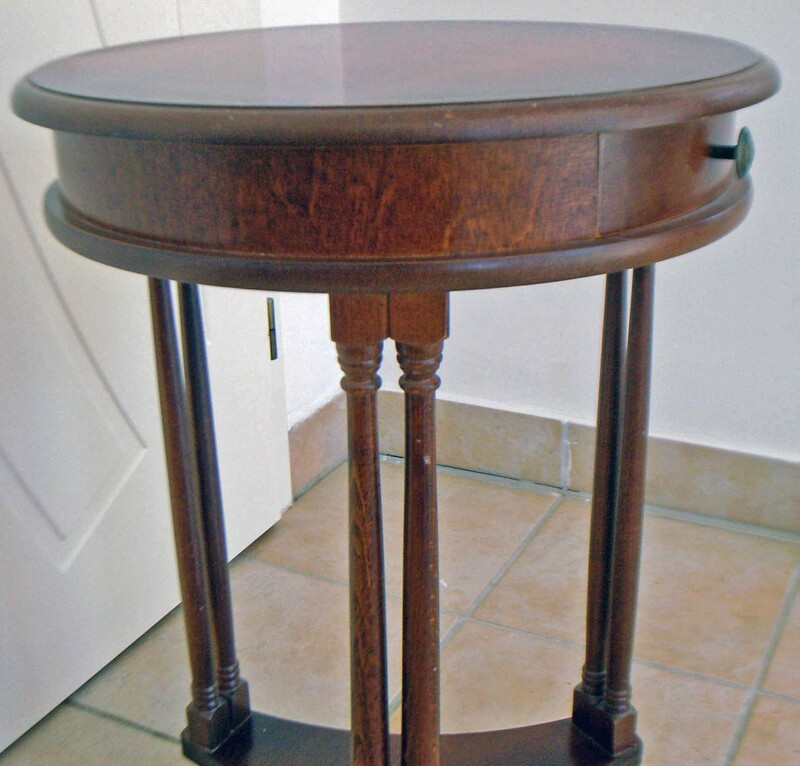 My gramophones are free of all of this breaks, without any repairing, in original condition. 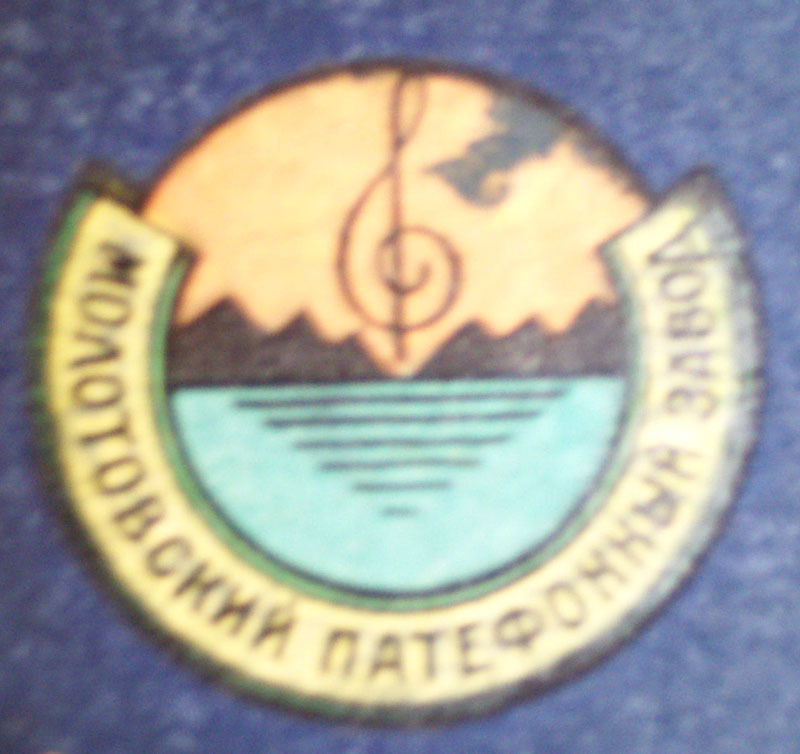 Contact me by e-mail, phone, or come to me to my city. 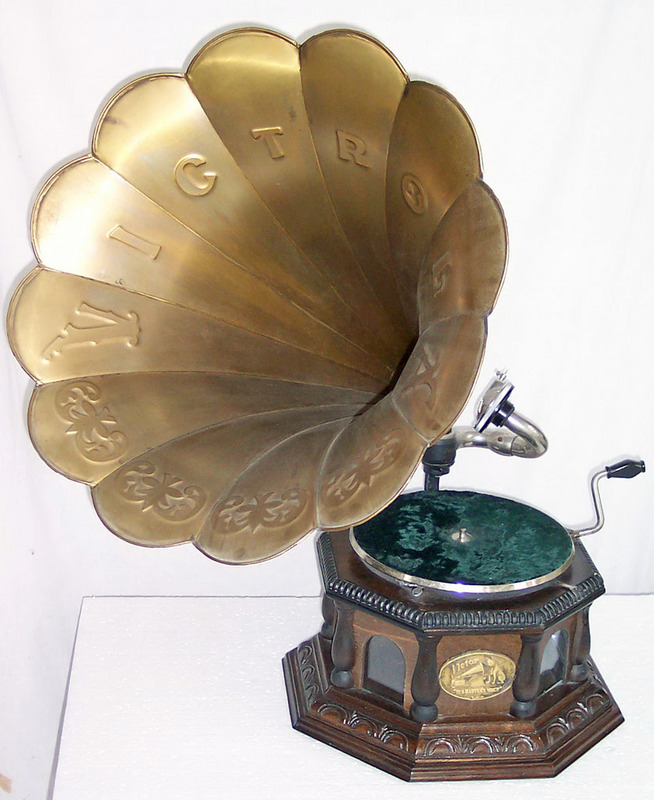 Buy gramophone in my home or I send it by post. 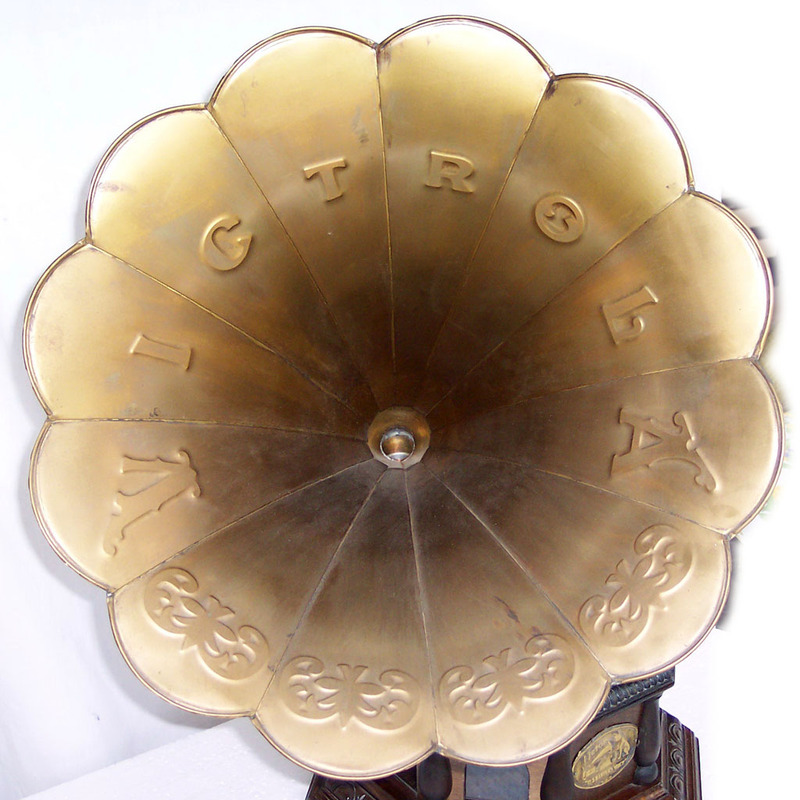 Hungarian post rates are here, the weight of every gramophone on it's detailed page.